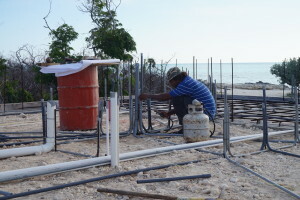 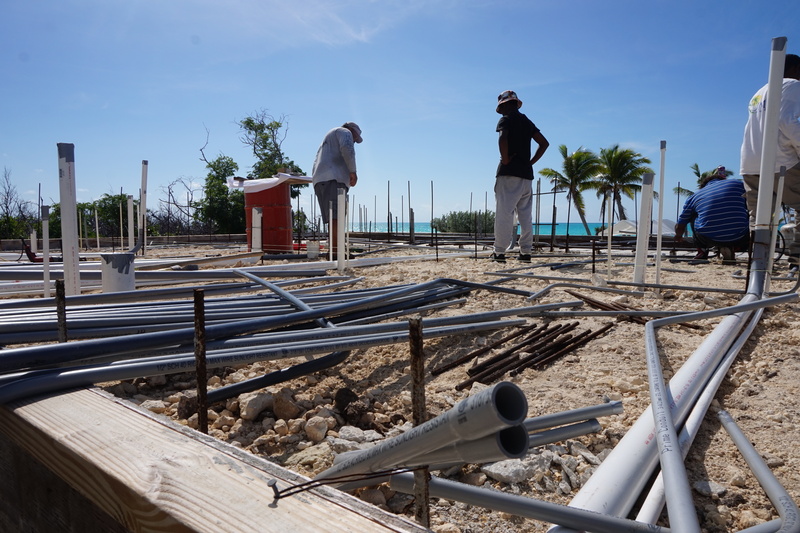 Work is progressing well on the Kitchen Kottage the first building to be constructed on the OCA, Cabbage Point, Bahamas Facility. 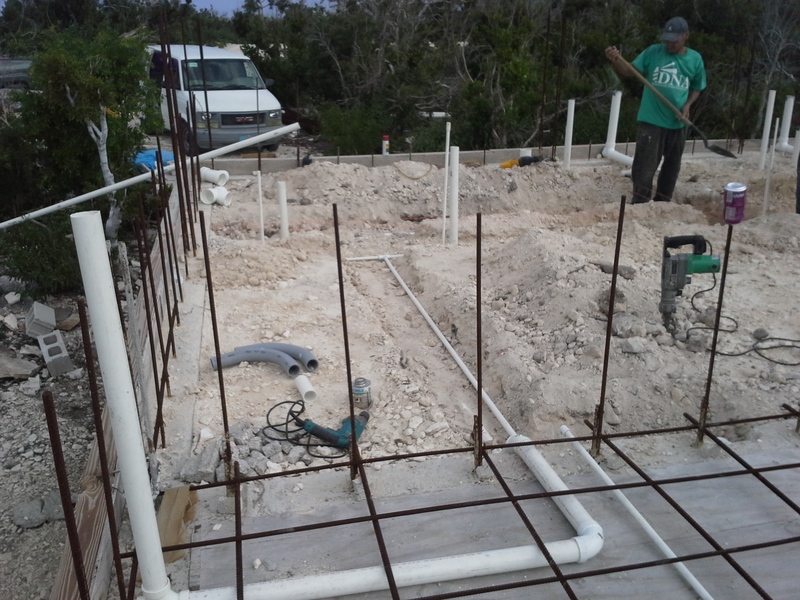 The plumbing and electrical rough-in are complete. 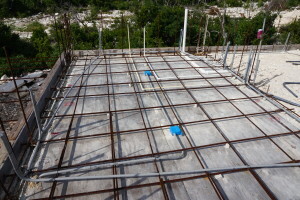 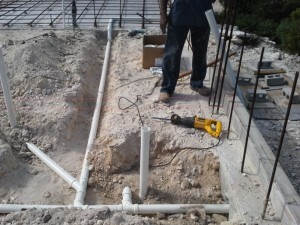 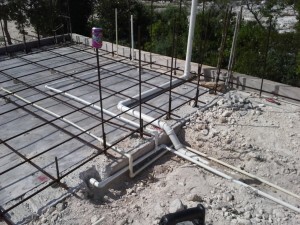 Next steps to lay down a radiant barrier, some more steel and pour the 32′ X 30′ X 6″ concrete slab. 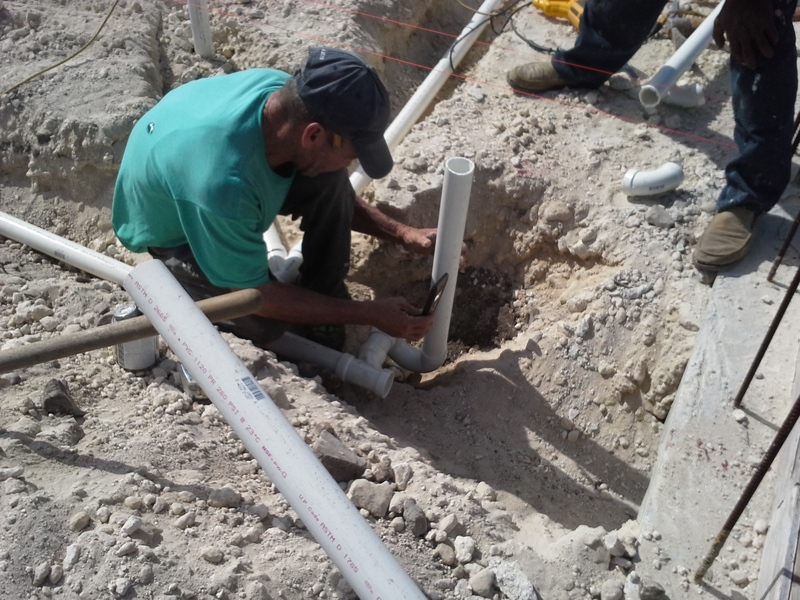 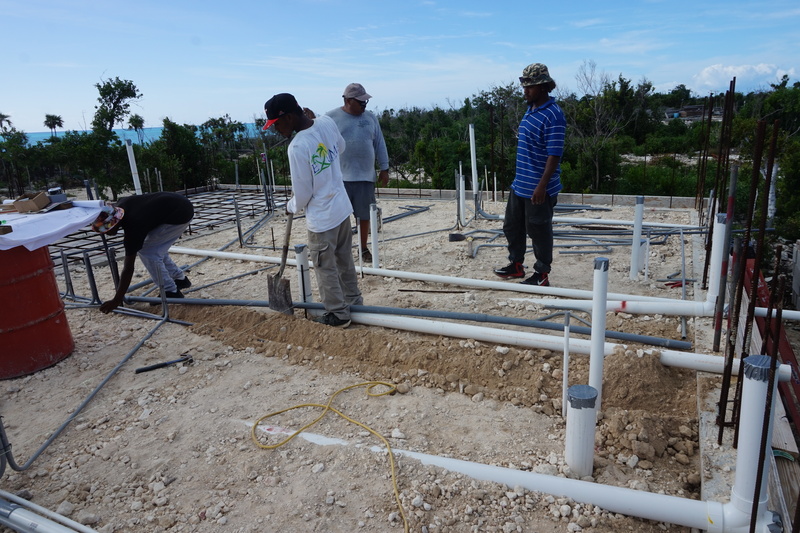 As with the plumbing and electrical work, OCA will utilize the local craftsman for the job! 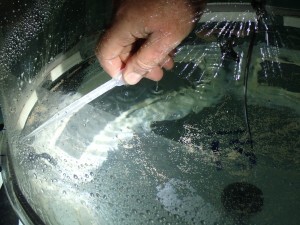 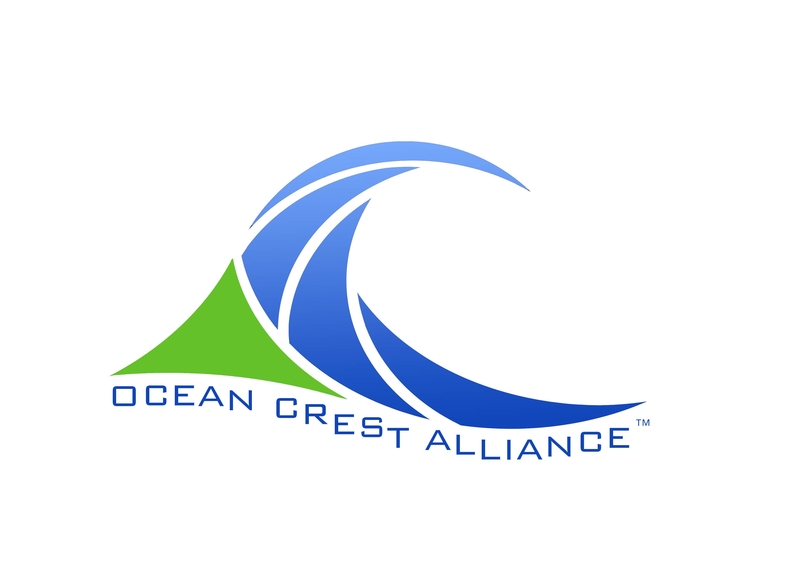 Ocean Crest Alliance is contacted by the Stimson organization about their “Secure Our Oceans” project. 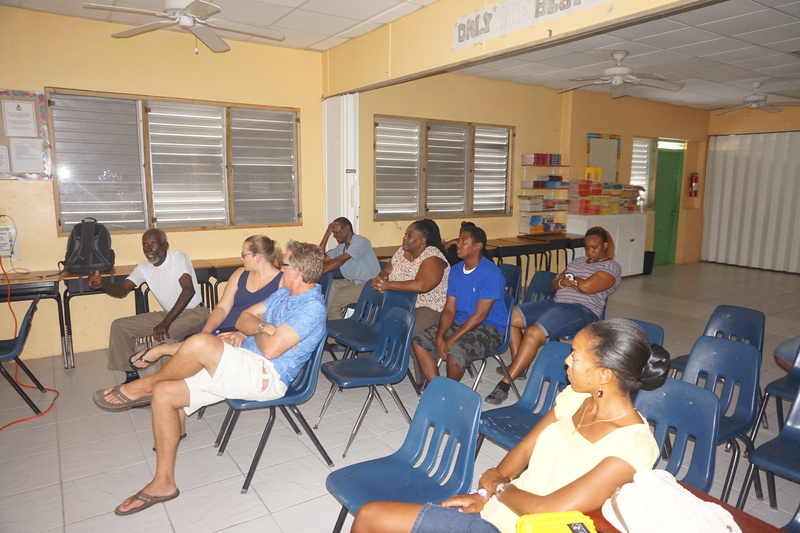 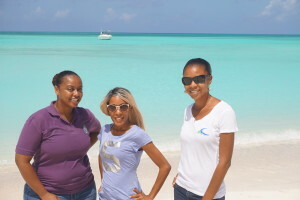 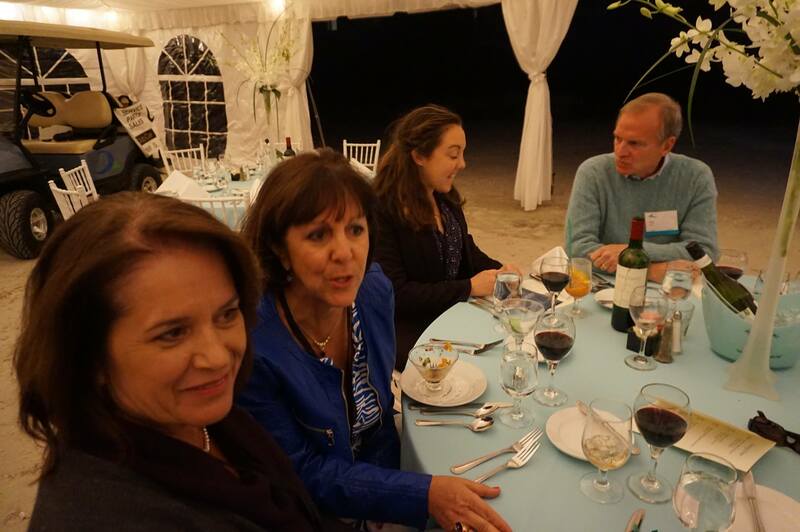 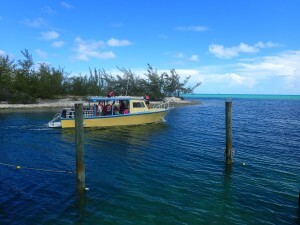 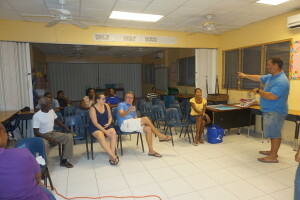 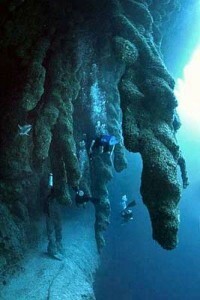 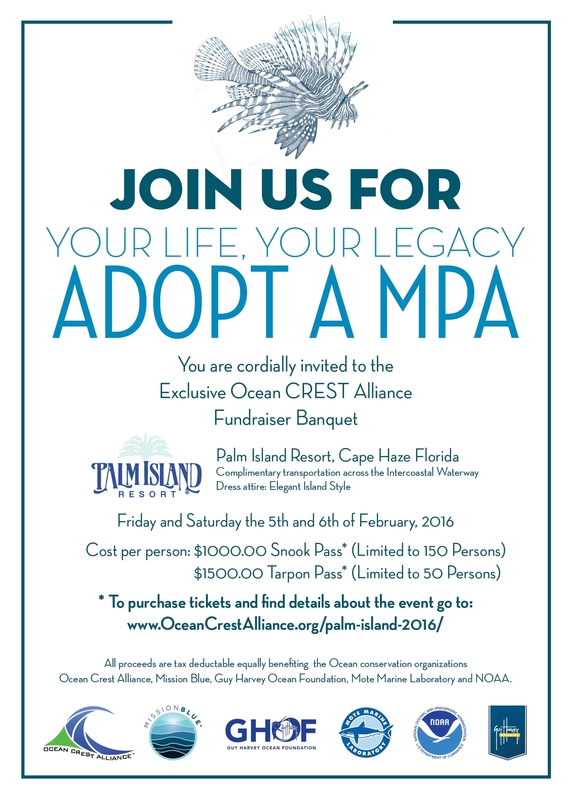 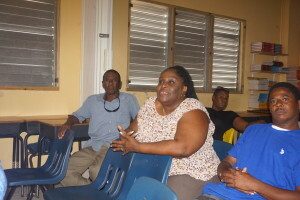 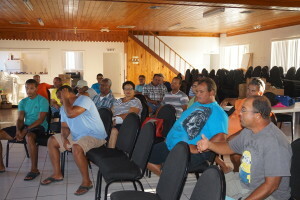 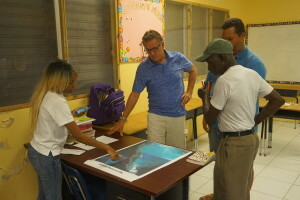 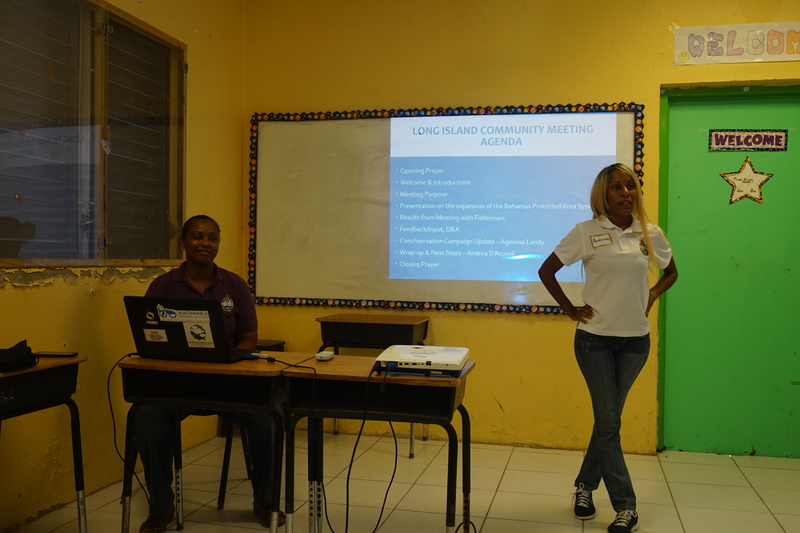 They are very interested in learning more about Ocean Crest Alliance work on our MPA in the Bahamas. 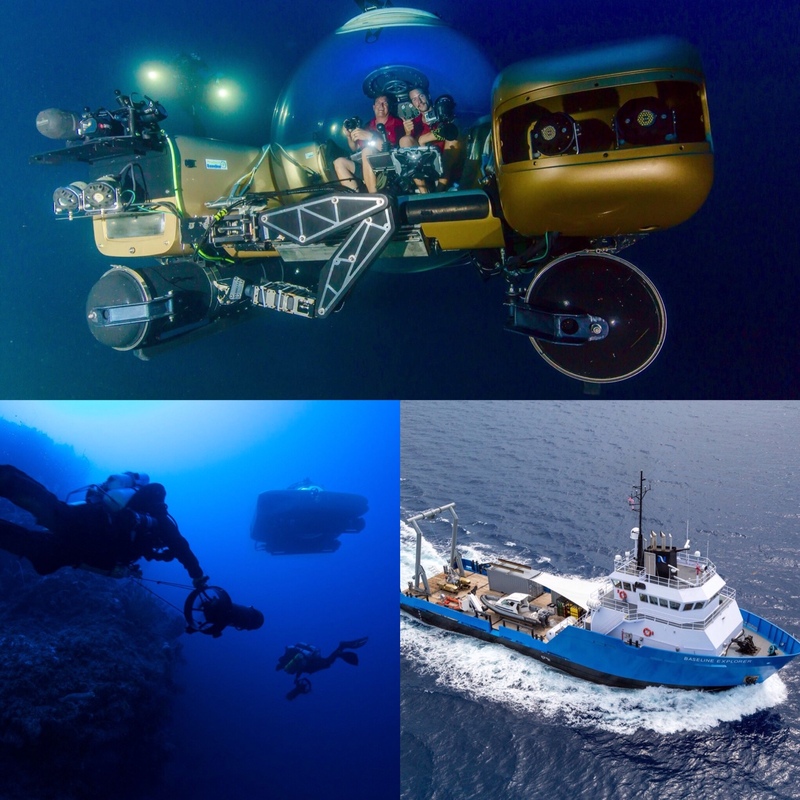 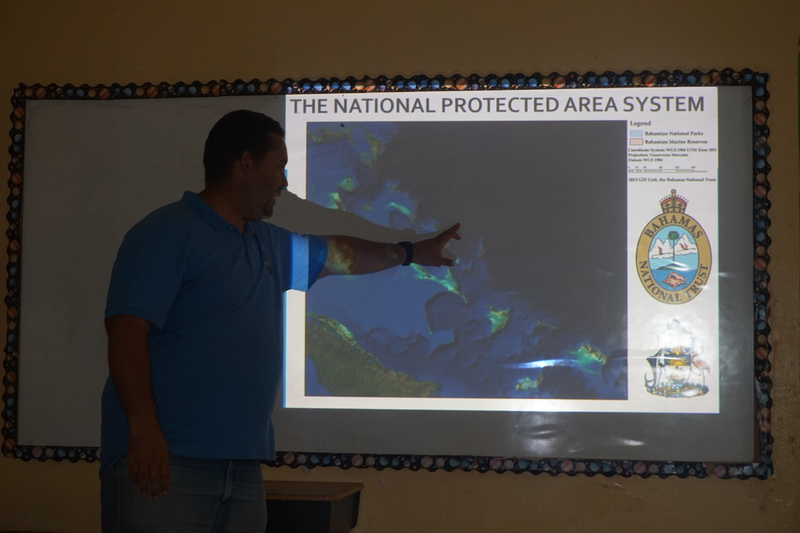 In addition to listing technology available for MPA protection, Secure Our Oceans is working hard to find partners such as OCA that can help bring some of this technology – and strong MPA enforcement – to the field. 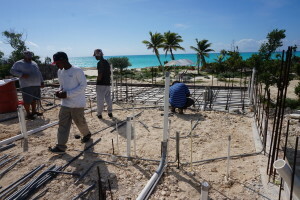 We are pleased to announce the collaboration between the ocean research and education organization Ocean CREST Alliance and marine underwater sculpture artist Celia Gregory, founder of The Marine Foundation This collaboration, brought about by our dear friend and supporters Robert Foos and The TerraMar Project, creates a new addition to the OCA EShare® program now offered at the OCA Long Island, Bahamas research and education facility. For information how you can be part of the exciting “Living Sculpture in the Sea” EShare® program please visit Ocean Crest Alliance Bahamas or contact OCA Director Joseph Ierna Jr directly at jijr-oca@oceancrestalliance.org for greater details. 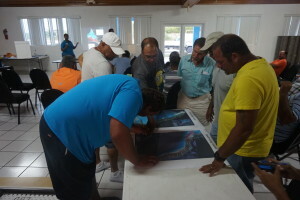 And over time will grow into a thriving “living reef” showcasing a thriving “spiny Lobster crawl”, “Conch wall”, “Nassau Grouper SPAG” and “Starfish colony”; “Living sculptures in the Sea” is a program that uses art for change – not only in awareness and education, but also directly on the restoration of coral reef habitats, fish stocks, and associated provision of livelihood. 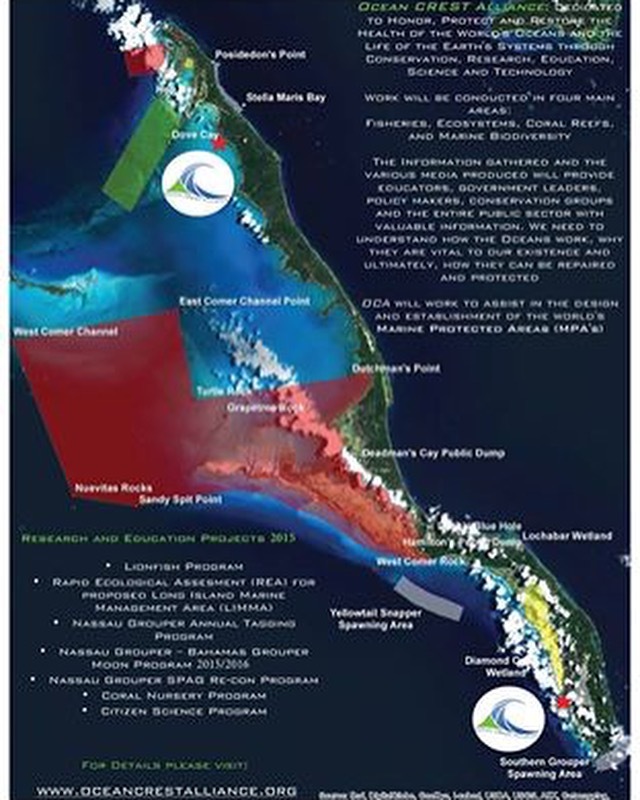 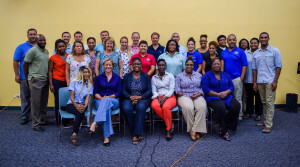 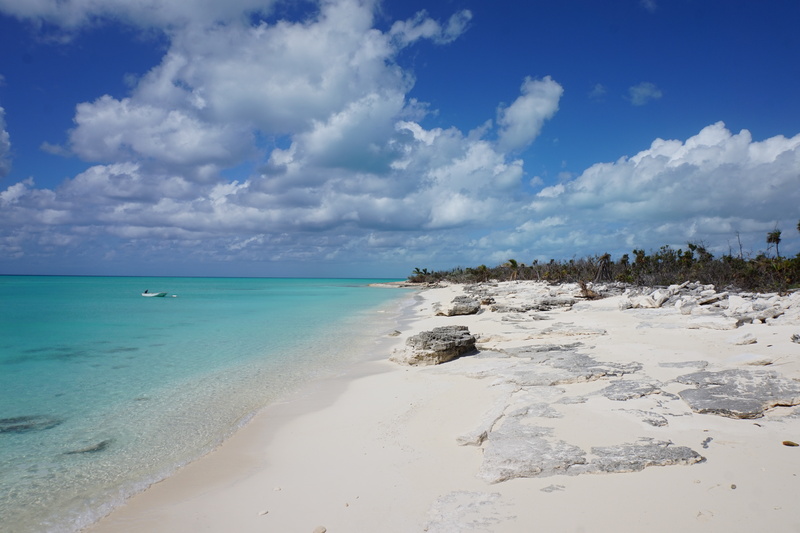 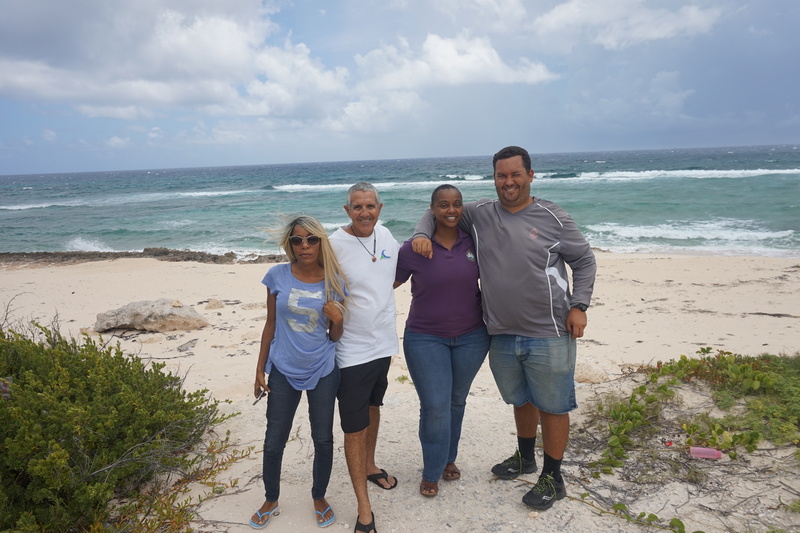 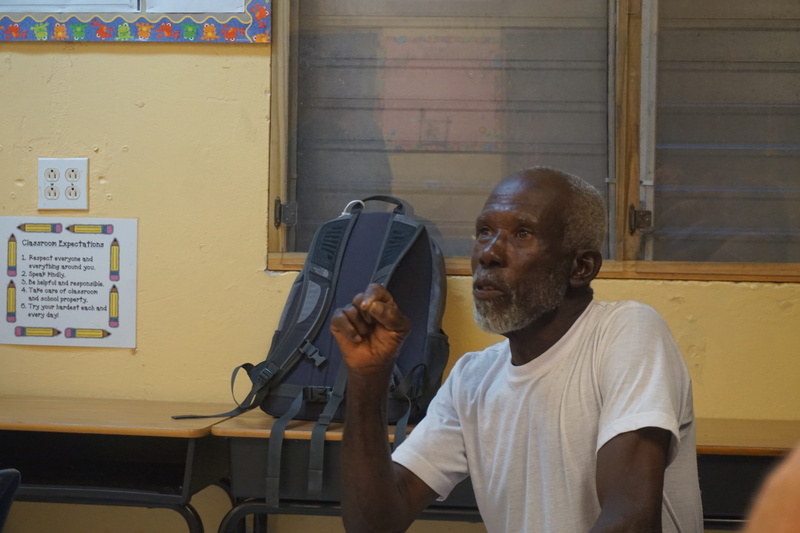 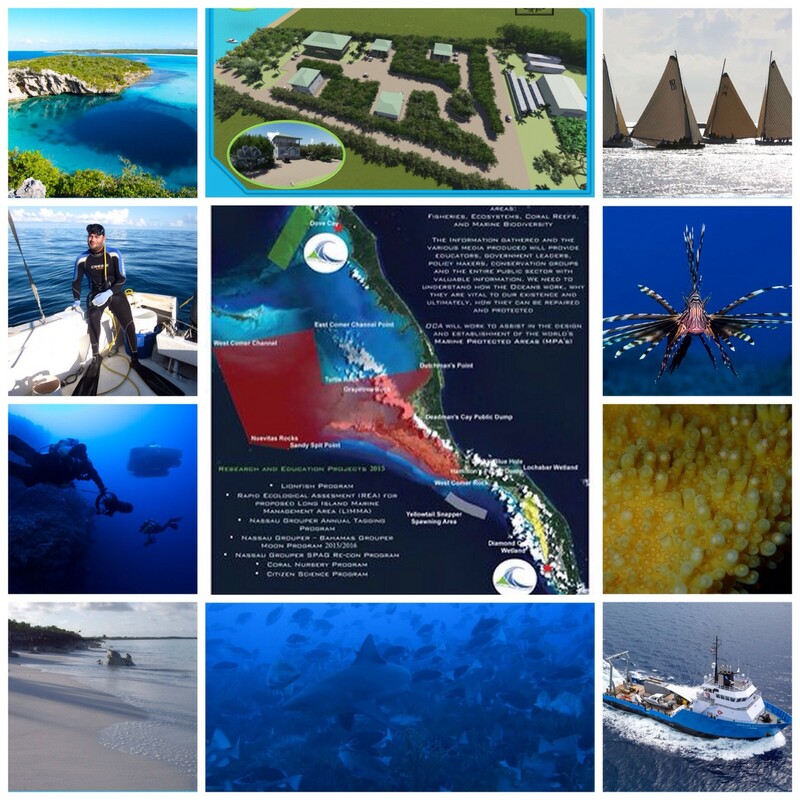 Connecting local communities with an international network to enable sustainable governance of our marine resources, while supporting our Bahamas marine heritage and economy of the island! 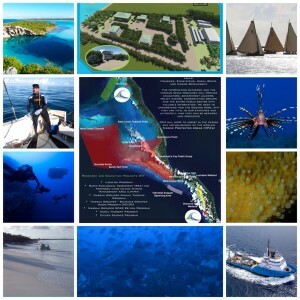 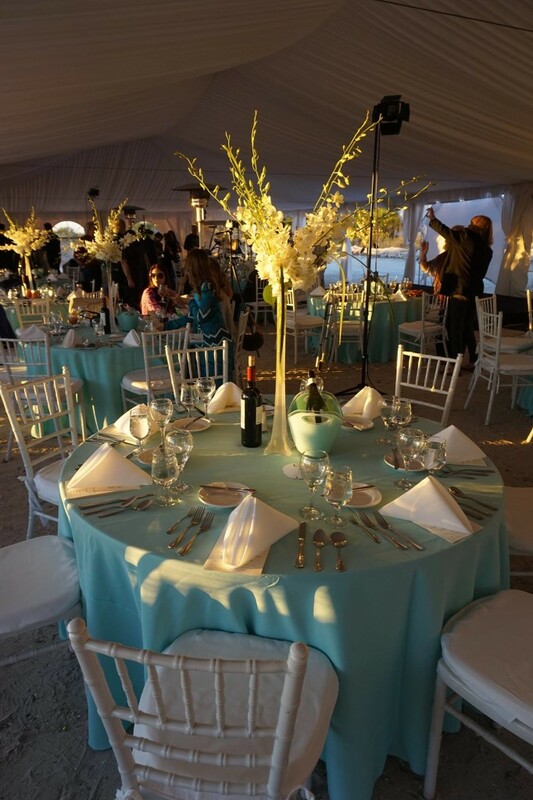 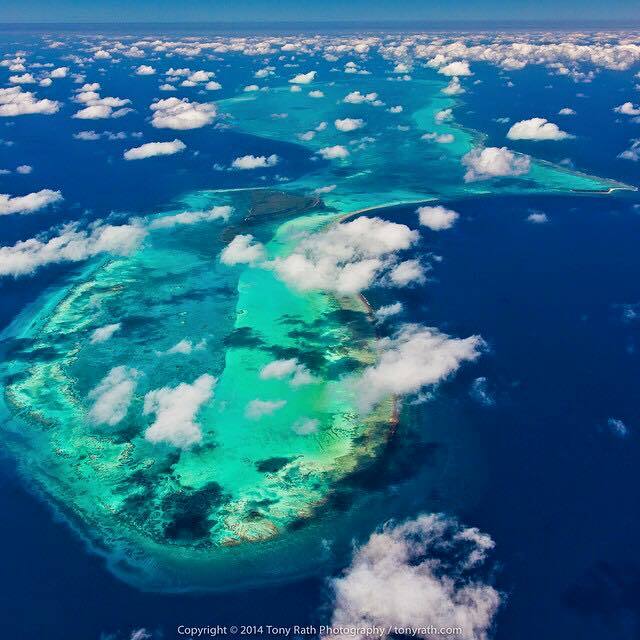 Ocean CREST Alliance, a USA 501c3 non-profit organization and Bahamas non-profit Registry is dedicated to Honor, Protect and Restore the Health of the World’s Oceans and the Life of the Earth’s Systems through Conservation, Research, Education, Science and Technology. 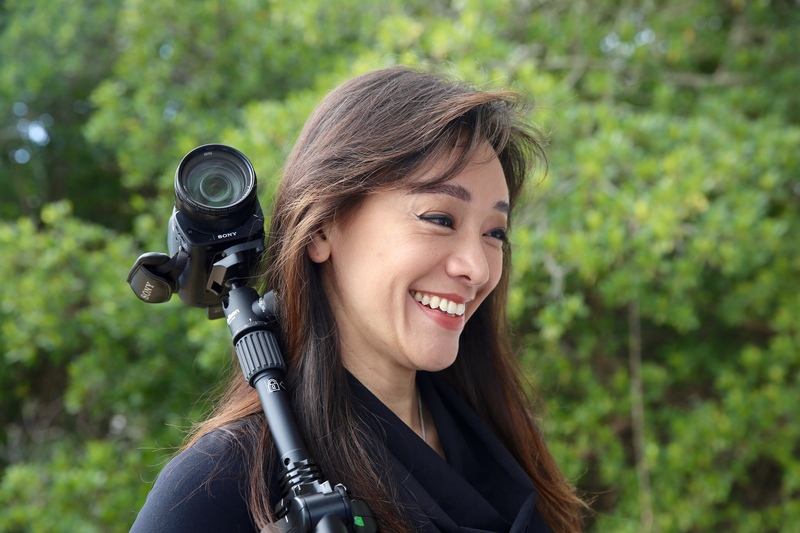 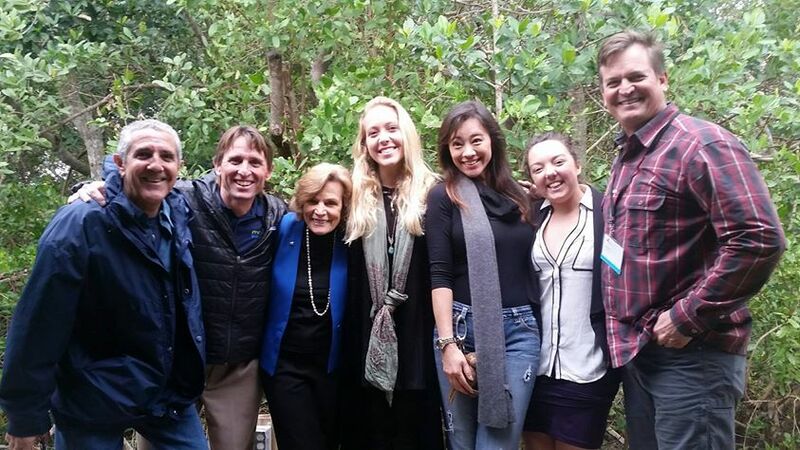 Celia Gregory founded The Marine Foundation because she felt things were not improving, that the threats to the environment and those that live are still prevalent. 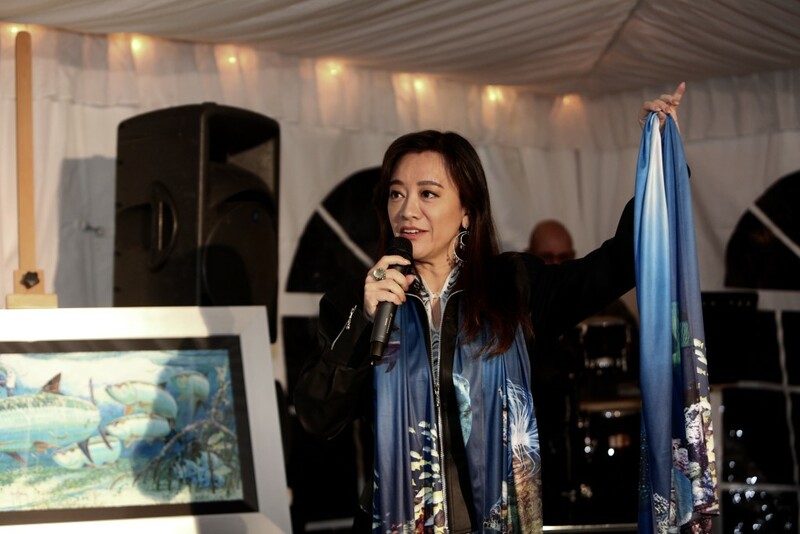 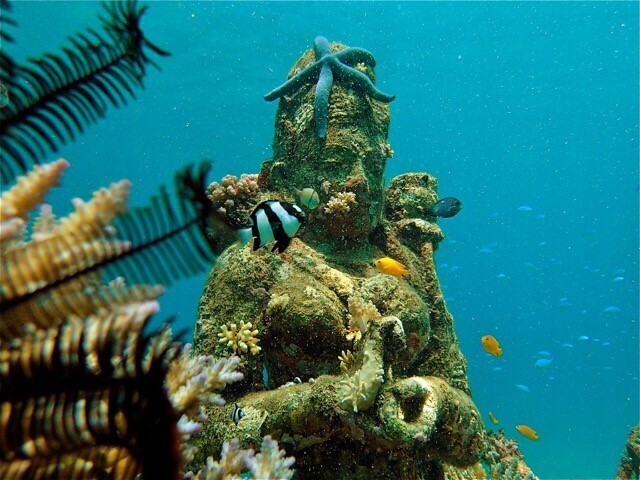 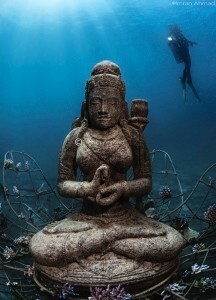 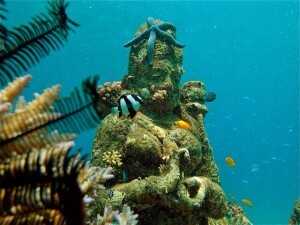 The Marine Foundation is an eco-arts organization dedicated to creating living underwater sculptures that regenerate marine ecosystems and support a network of coral gardens around the world. 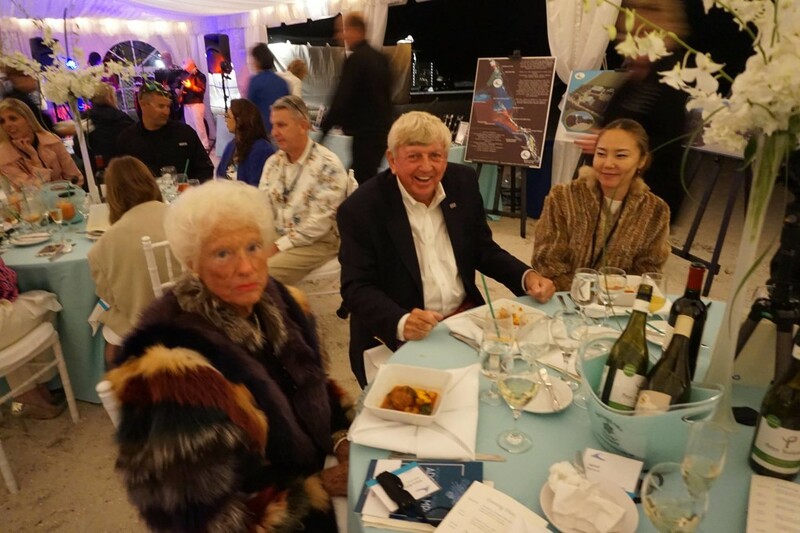 Celia’s aim for The Marine Foundation, she chooses the use of the word foundation because for Celia it conjures up images of a strong grounding that supports; to support a new vision of value, respect and appreciation of the resources and pleasures the oceans provides. 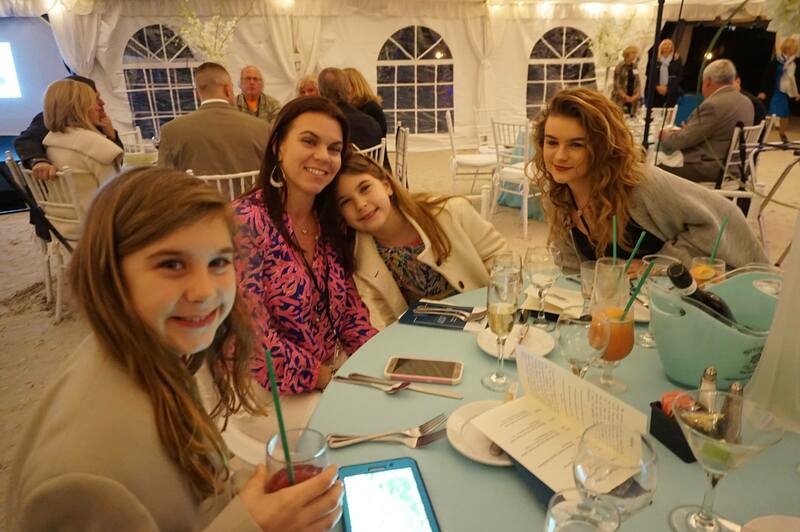 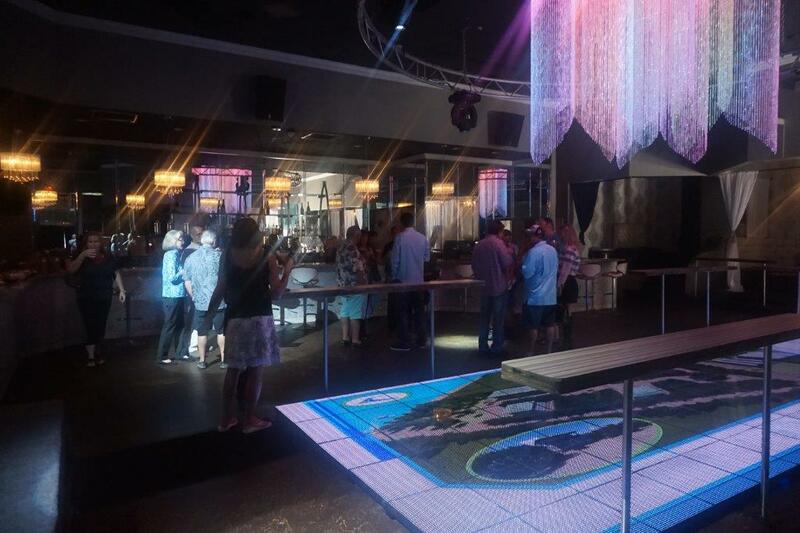 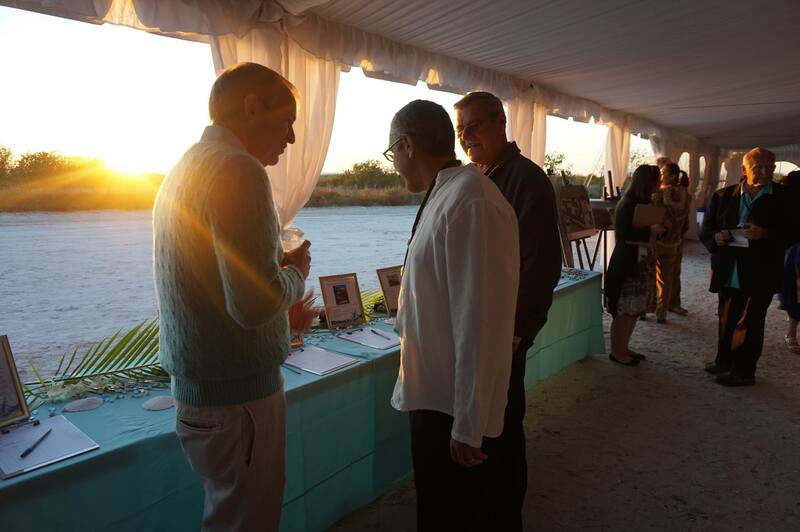 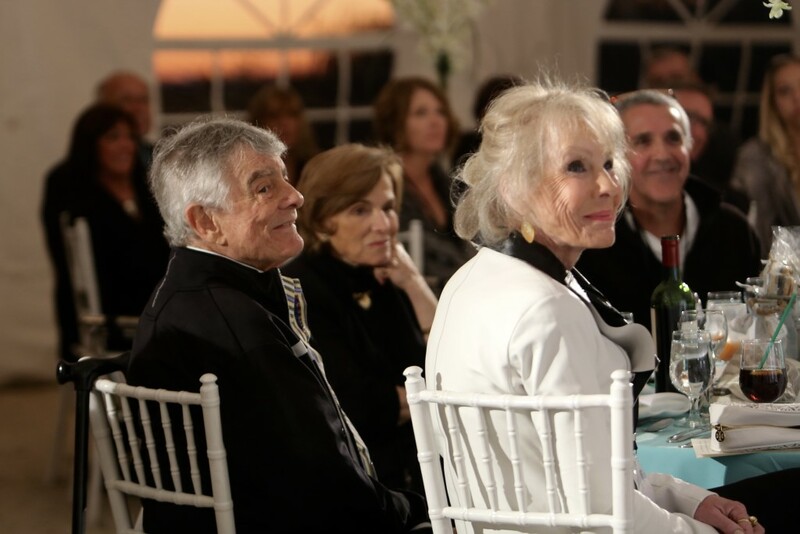 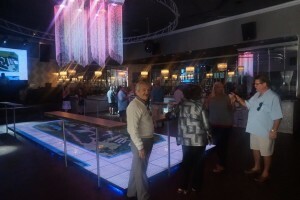 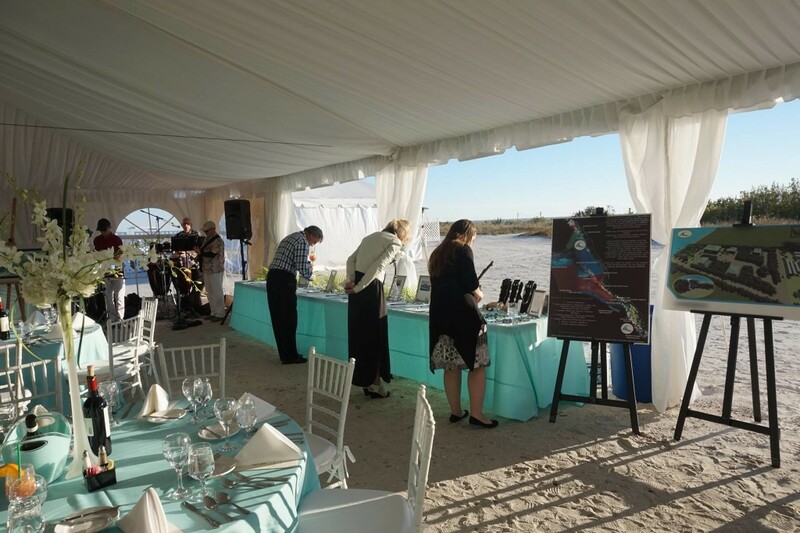 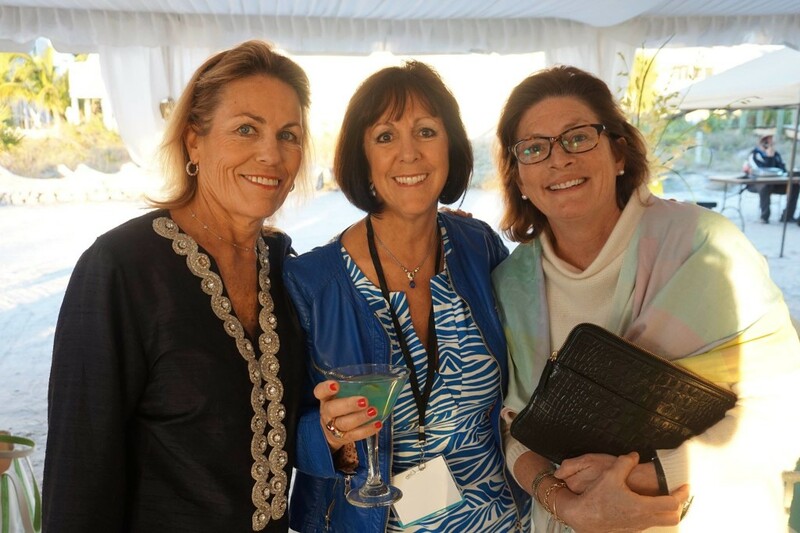 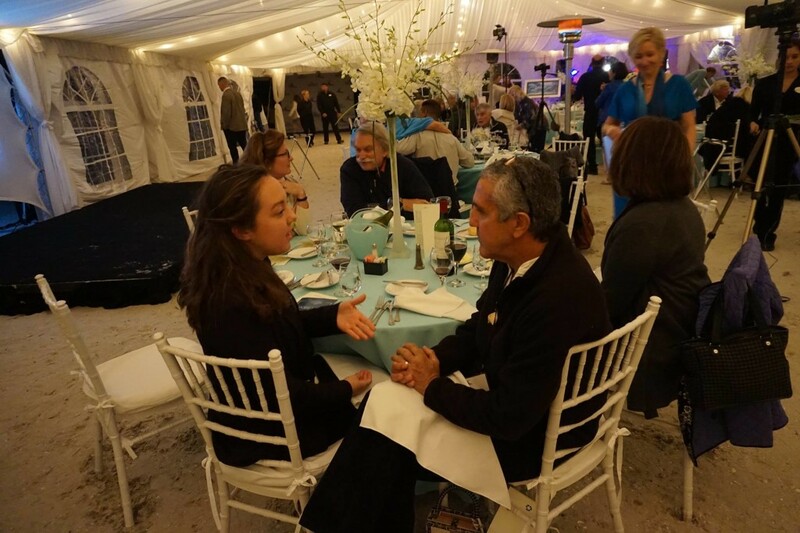 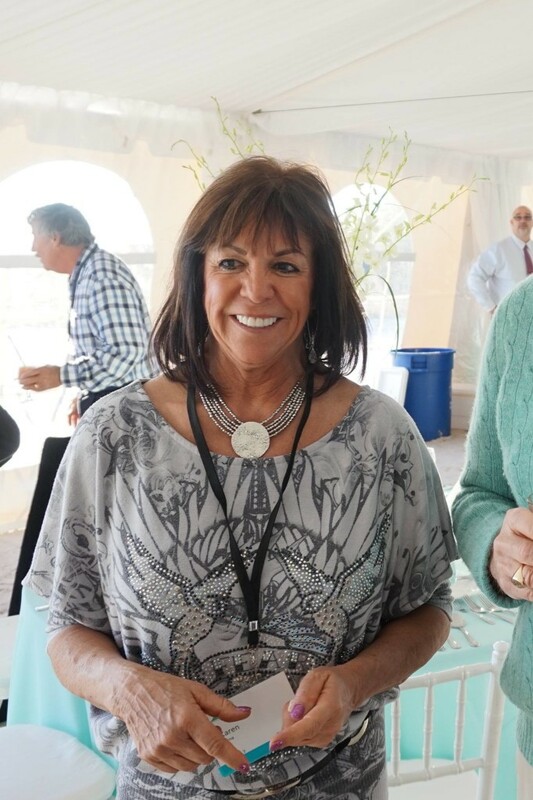 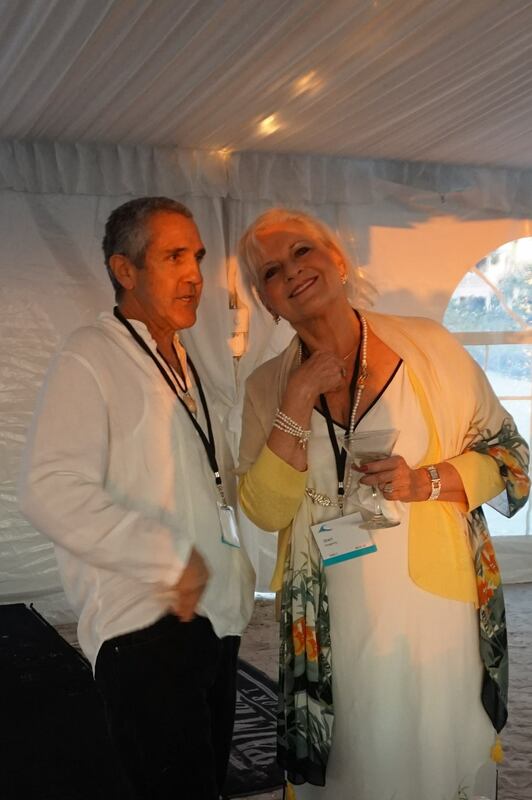 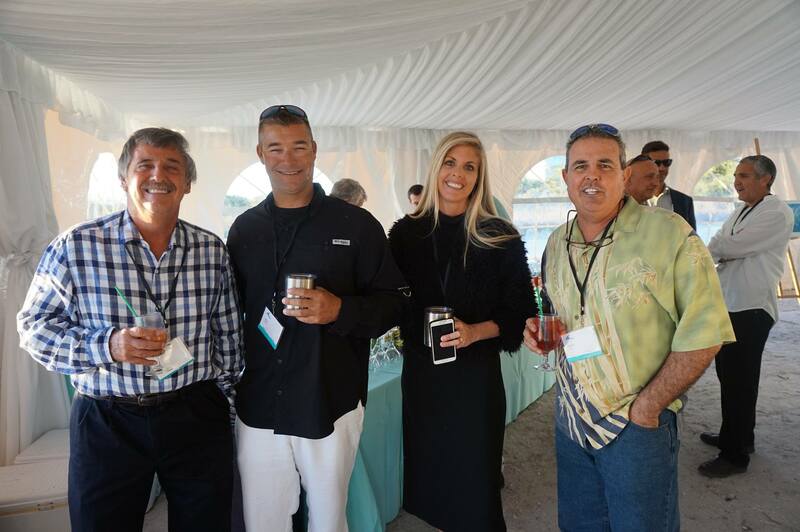 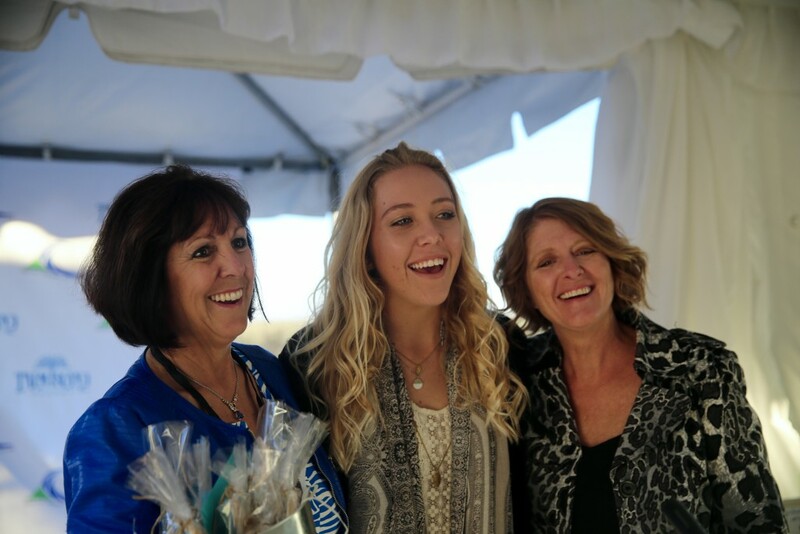 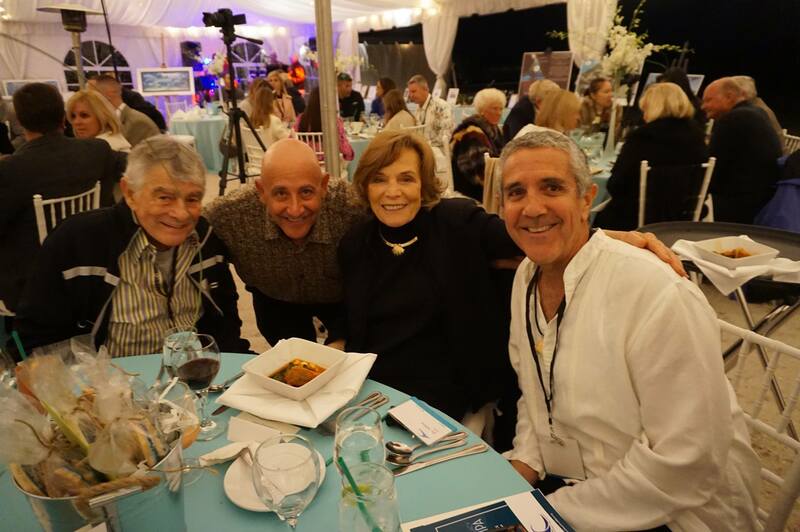 We wish to thank all of our friends and supporters for helping to make the William Trubridge – Ocean Crest Alliance fundraiser brunch a very cool and casual success! Thanks to all of you we managed to raise $1725 towards our ocean conservation efforts! Funds will be split 50/50 between Trubridge and OCA. 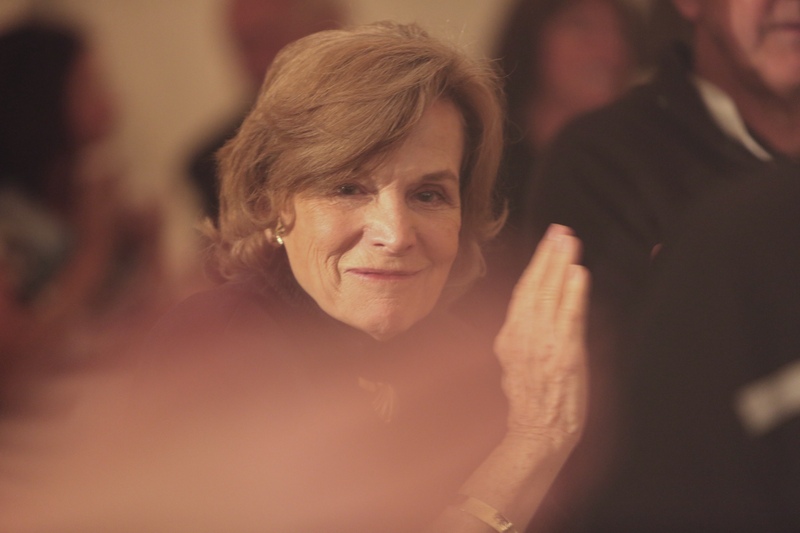 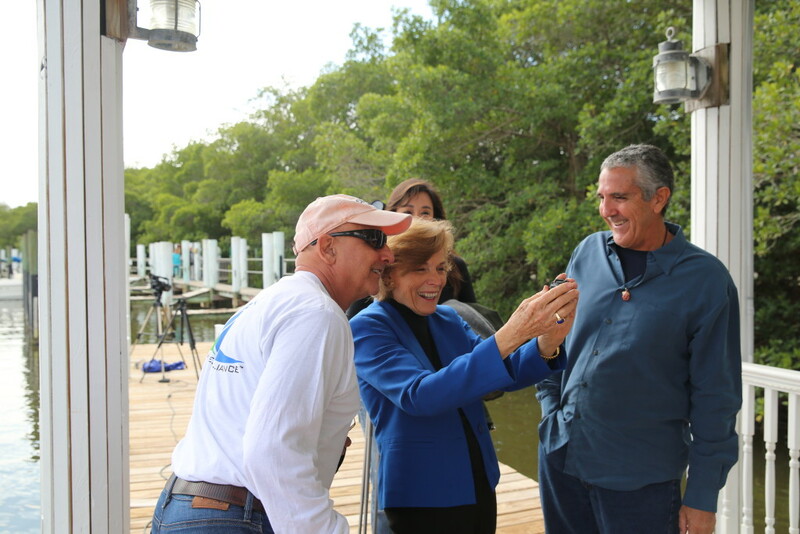 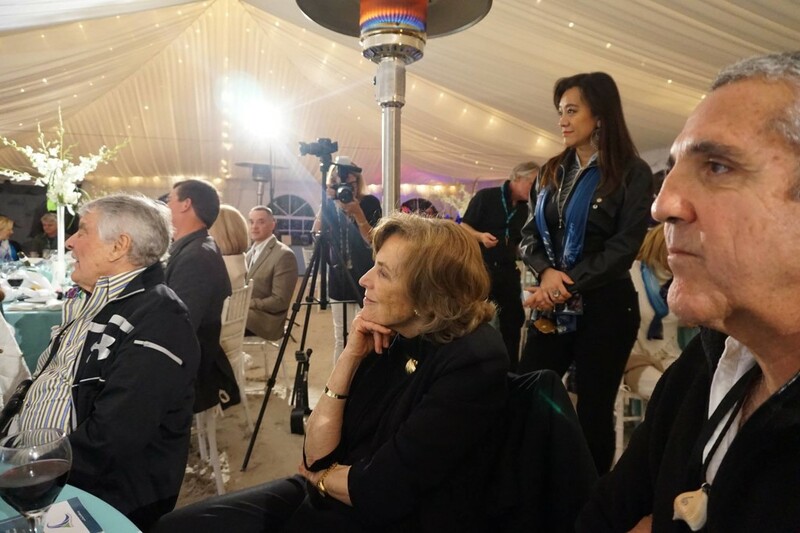 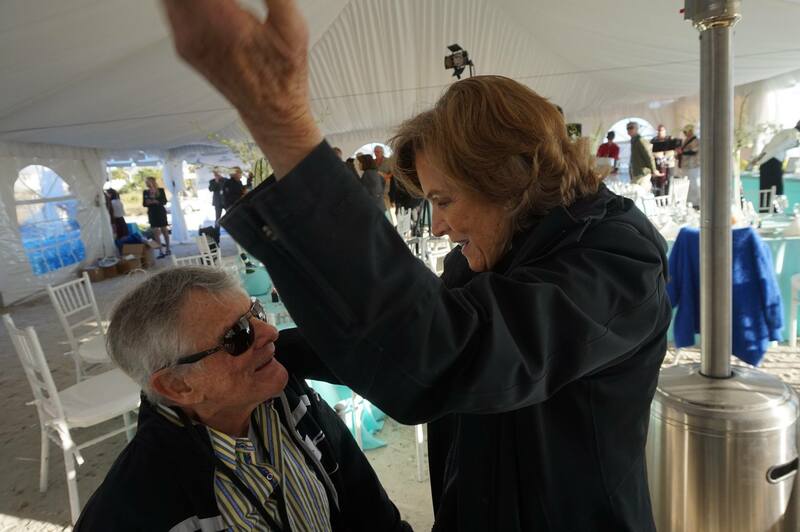 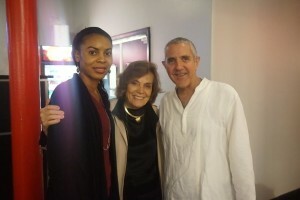 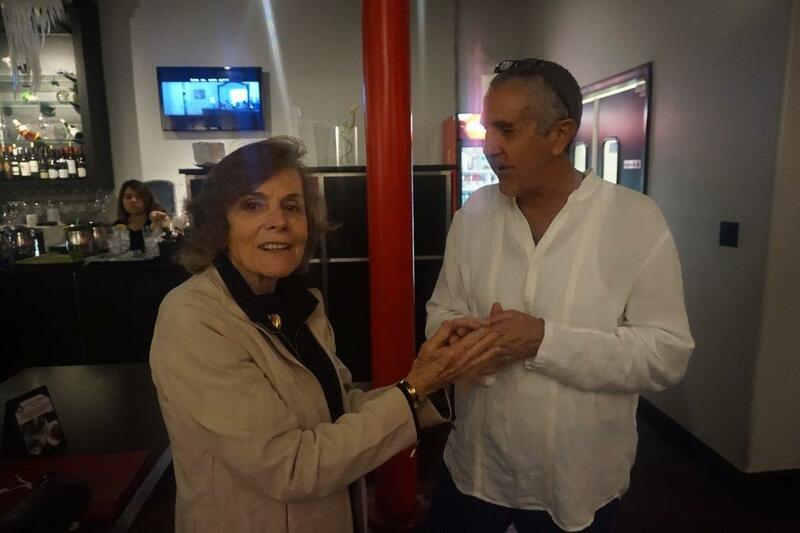 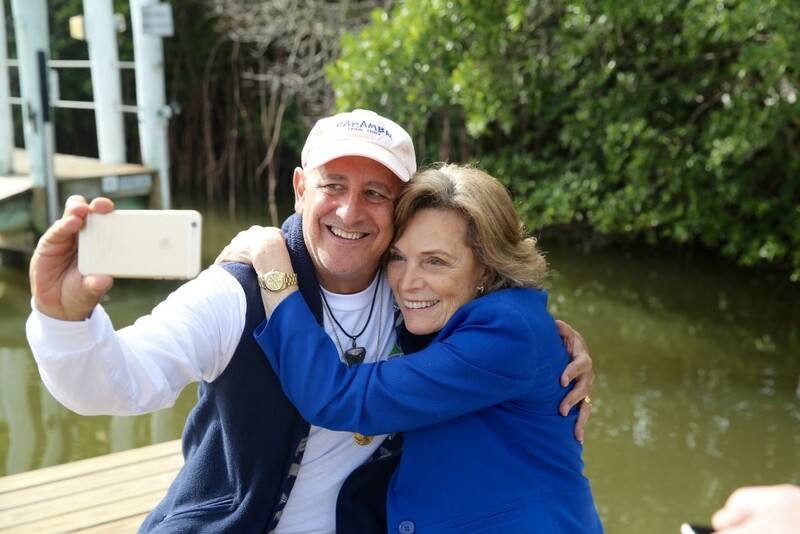 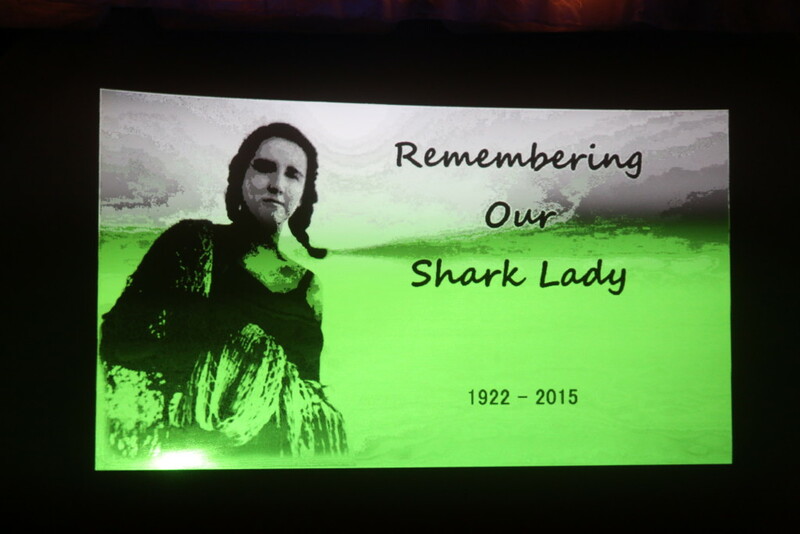 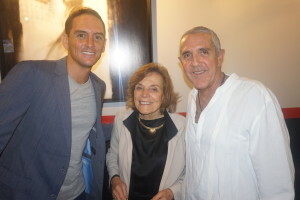 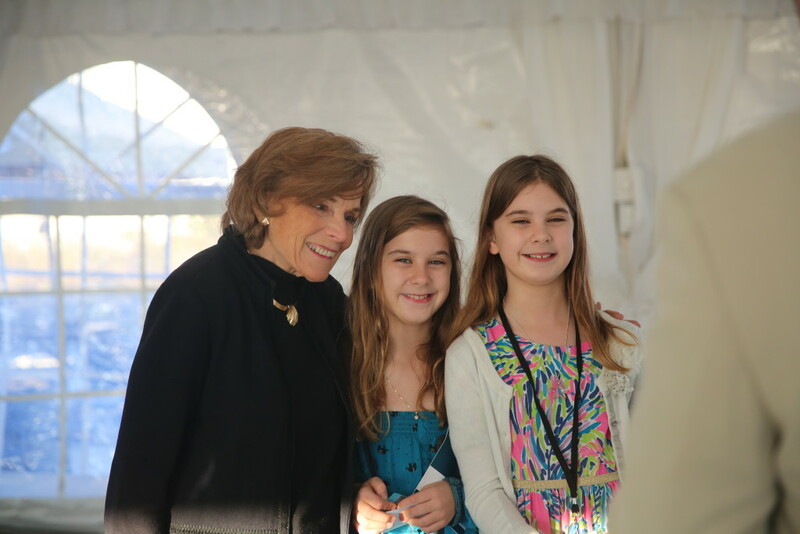 We even had an opportunity to chat with our Ocean Hero and Mentor- Dr. Sylvia Earle!! 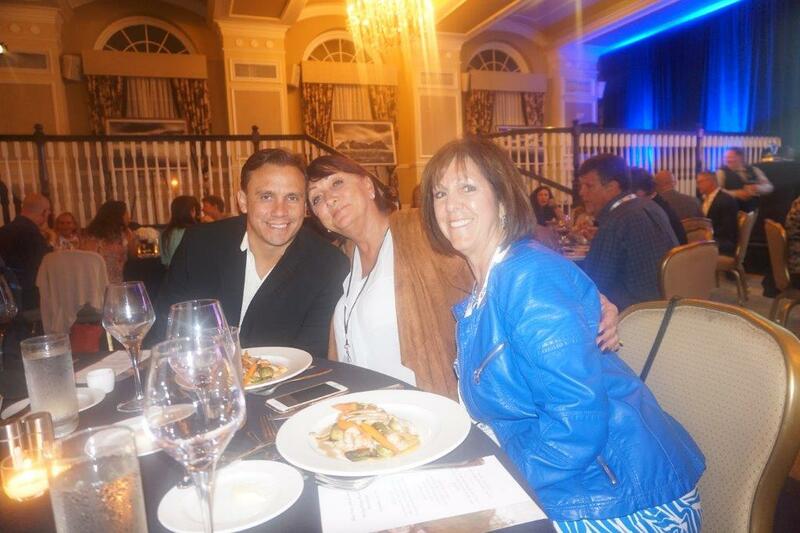 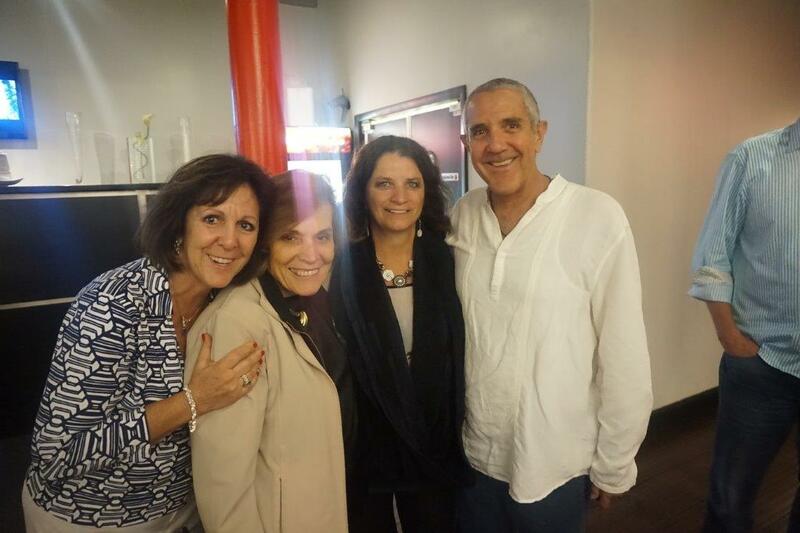 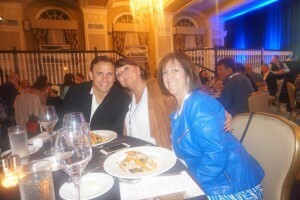 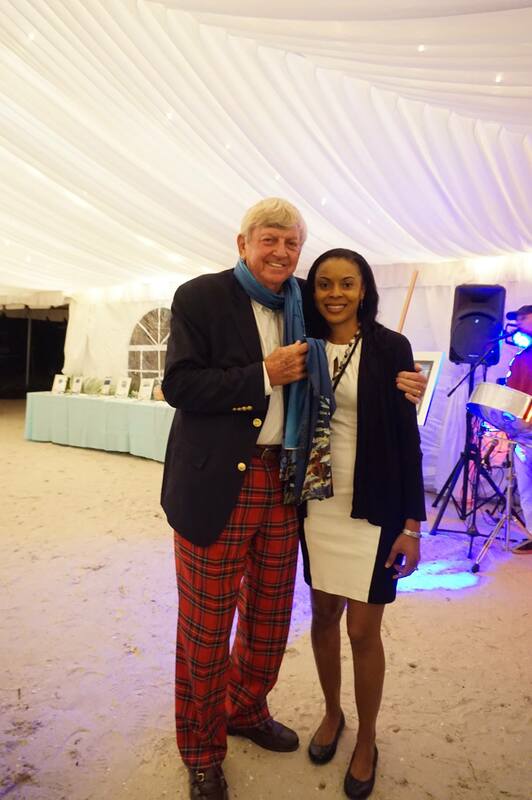 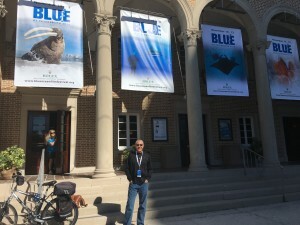 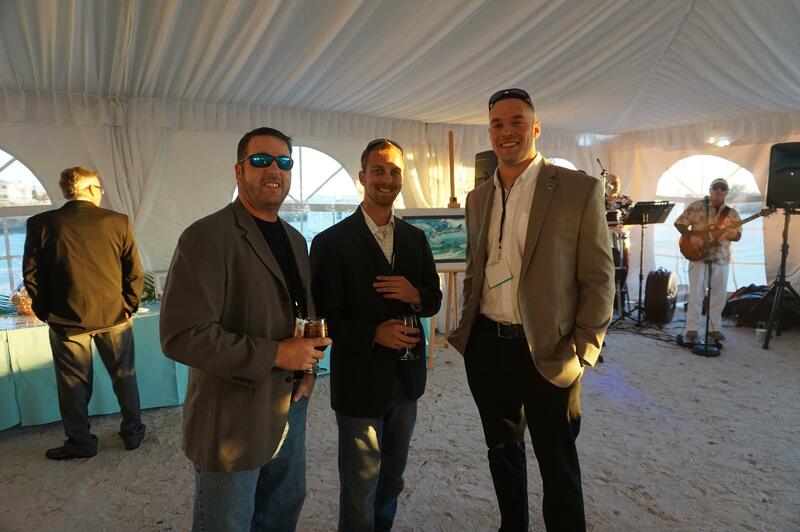 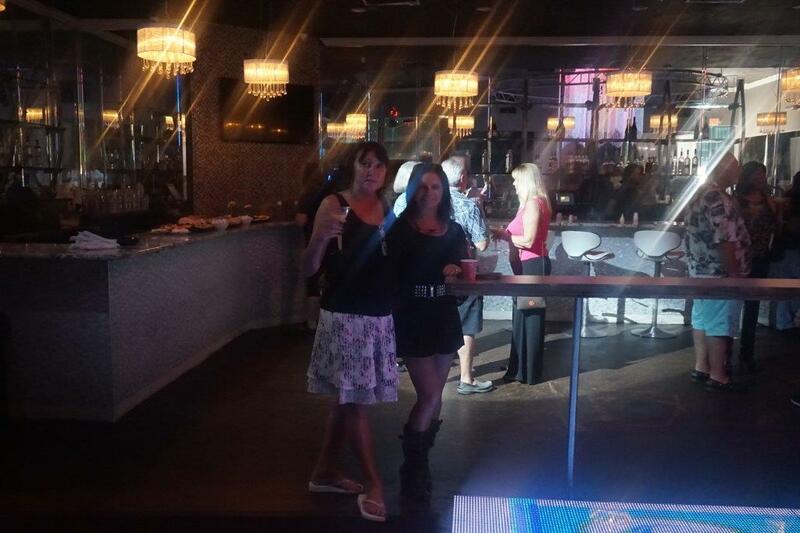 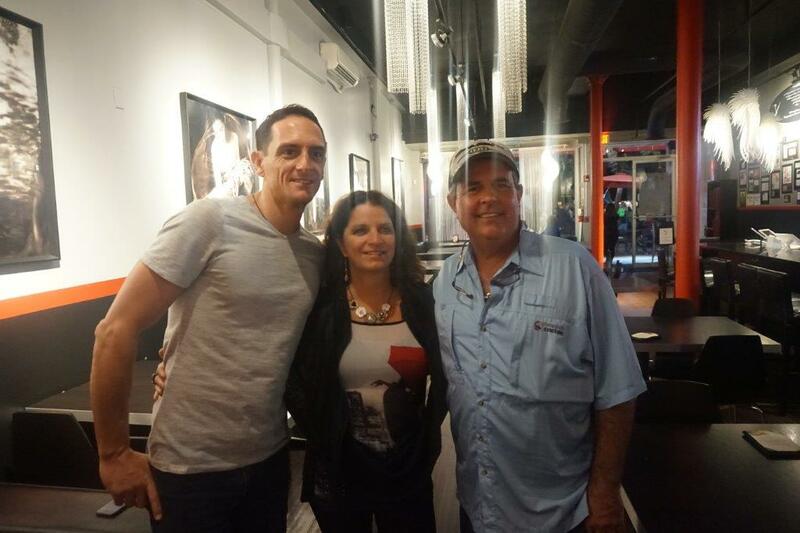 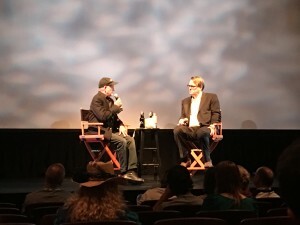 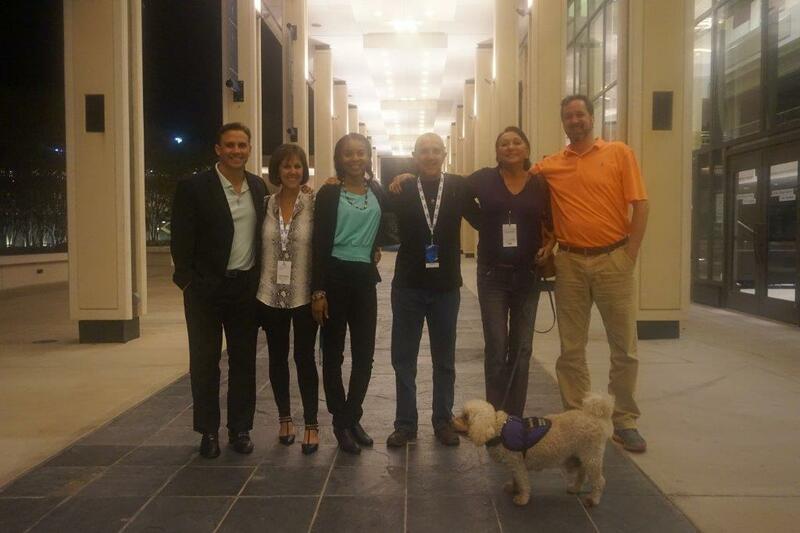 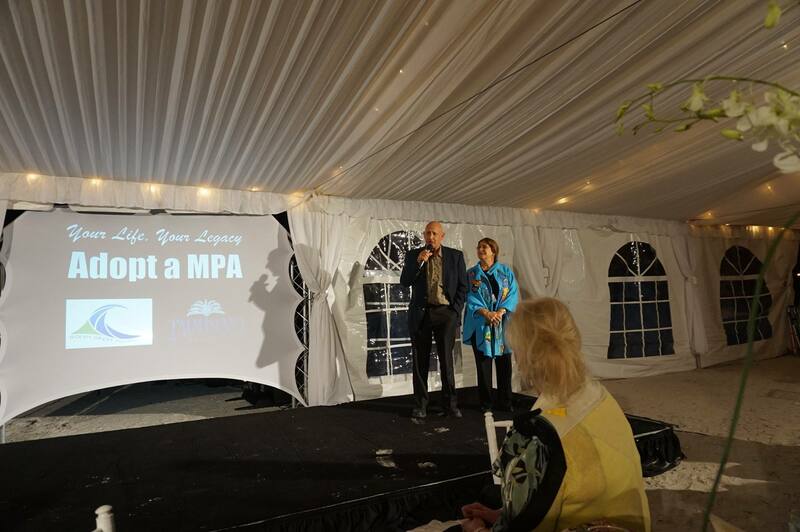 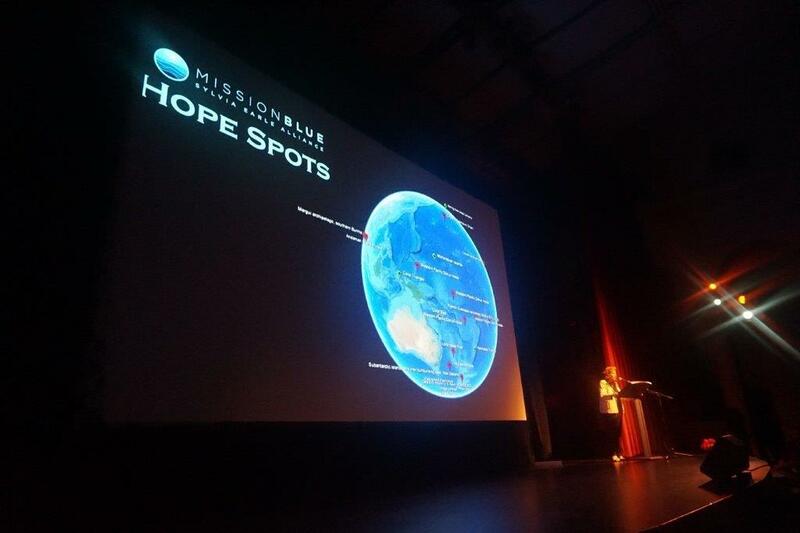 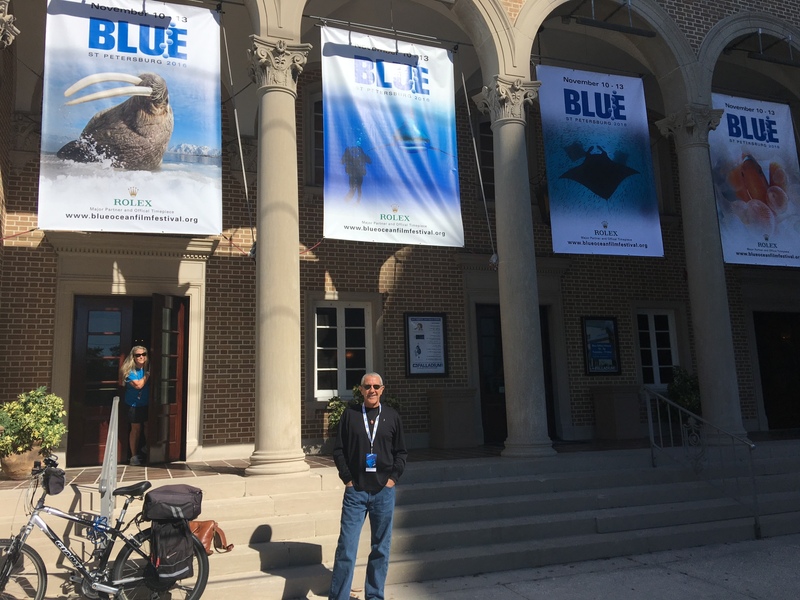 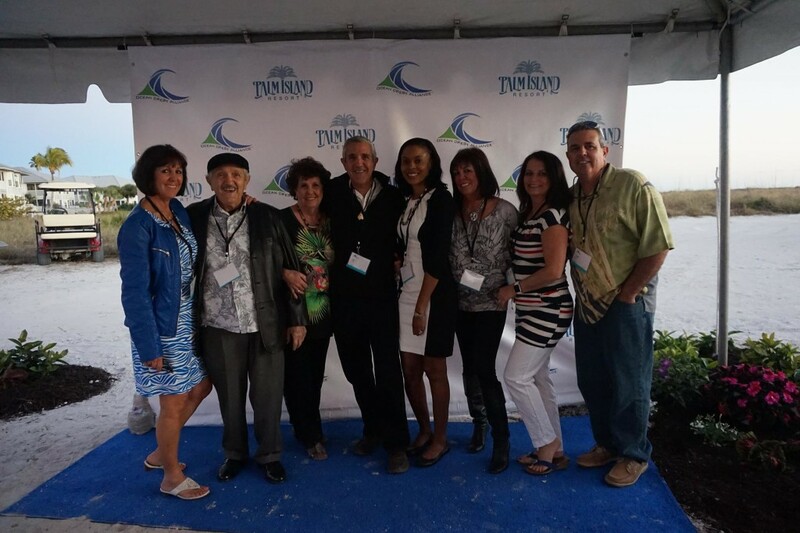 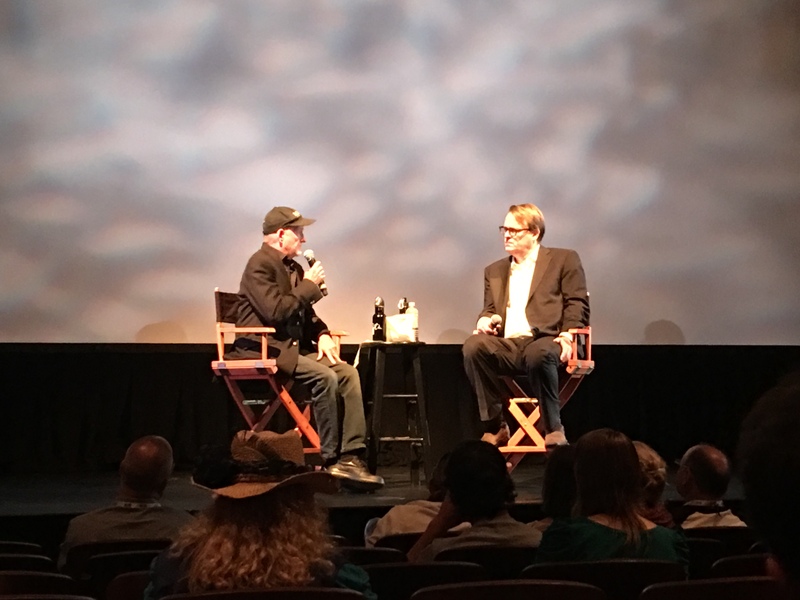 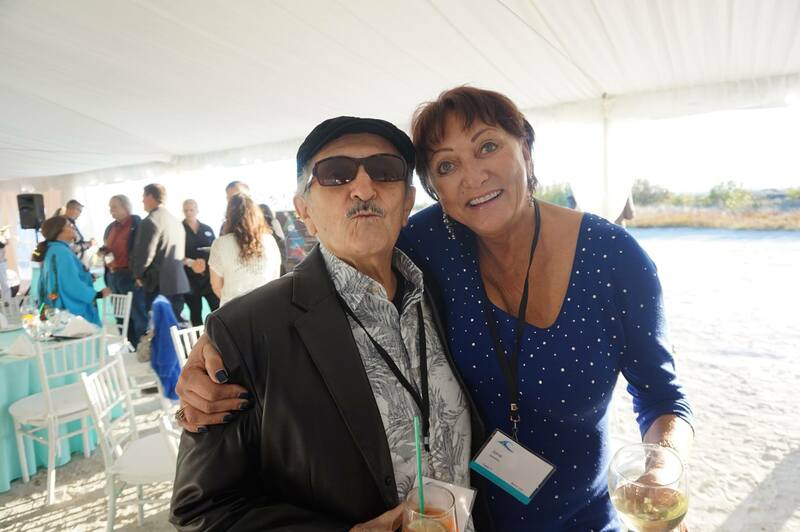 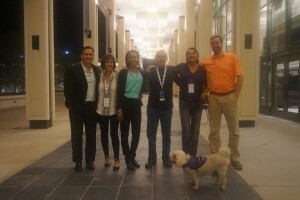 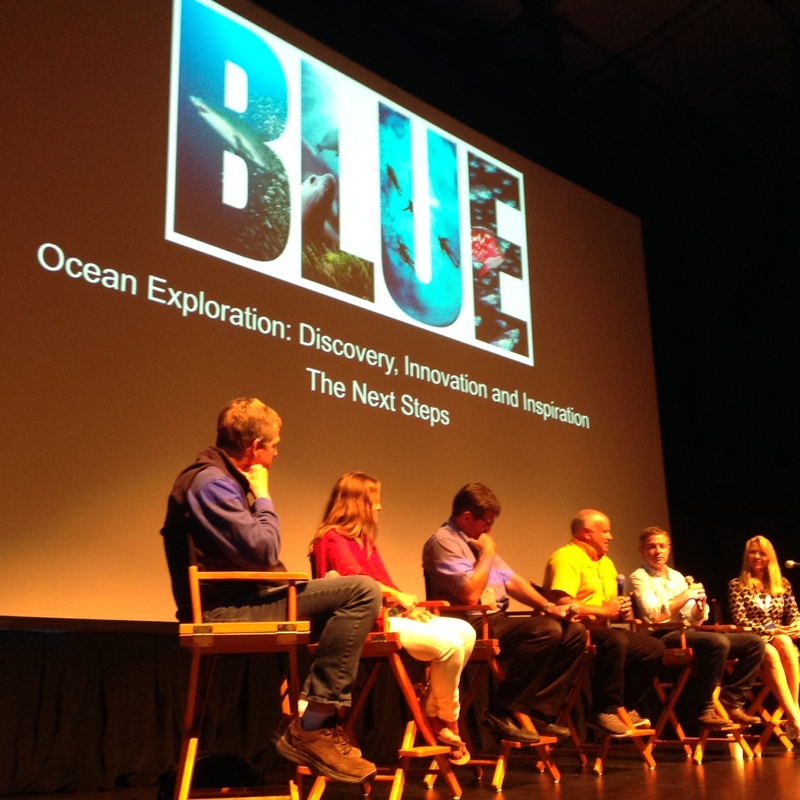 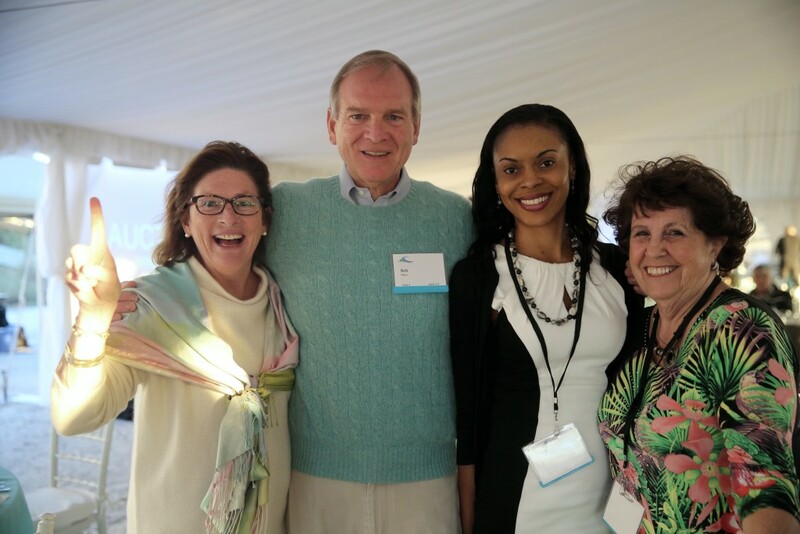 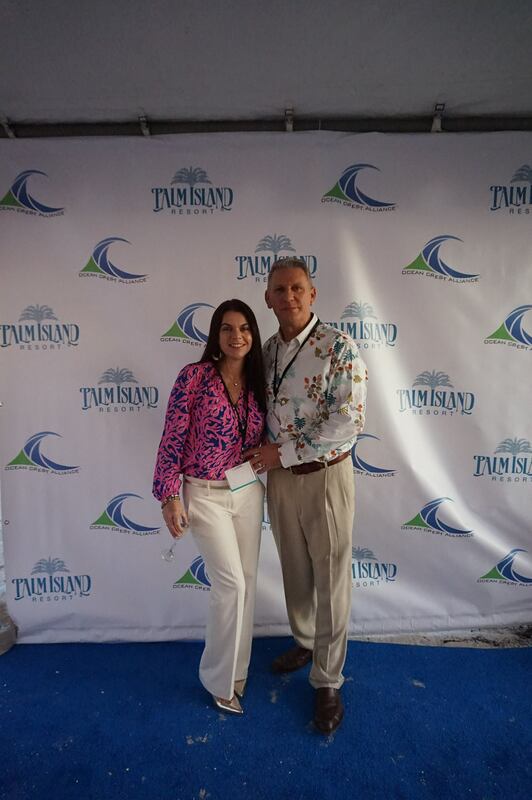 Team Ocean Crest Alliance attends BLUE Ocean Film Festival – St. Petersburg, Florida, OCA’s USA headquarters. 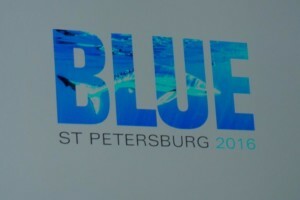 Every two years ocean leaders, filmmakers, photographers, scientists, explorers, entertainment executives – and the general public– gather in St. Petersburg, FL at BLUE to honor the best in ocean filmmaking, to learn more about the issues facing our oceans, and to collaborate on improving the future of our oceans and humanity. 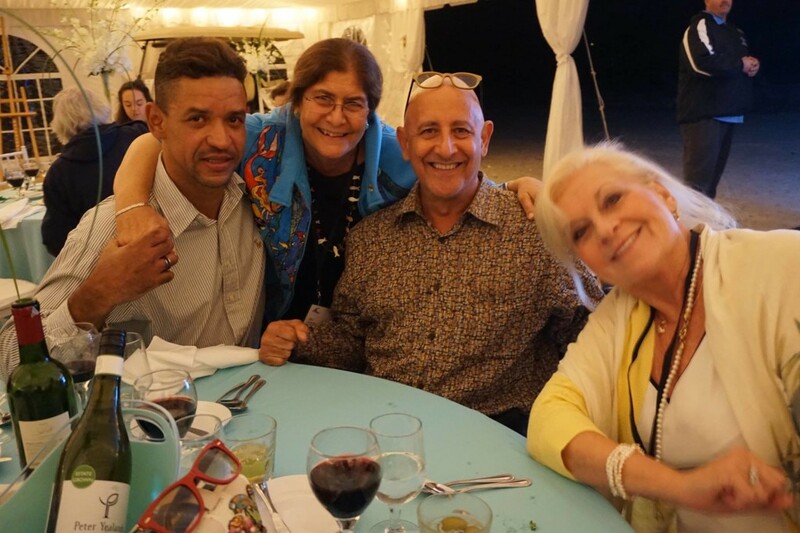 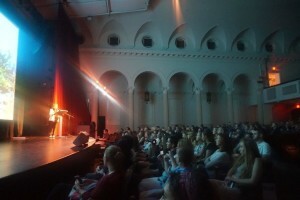 The seven-day event is charged with energy as these diverse groups of people sharing knowledge and ideas with each other and with the general public. 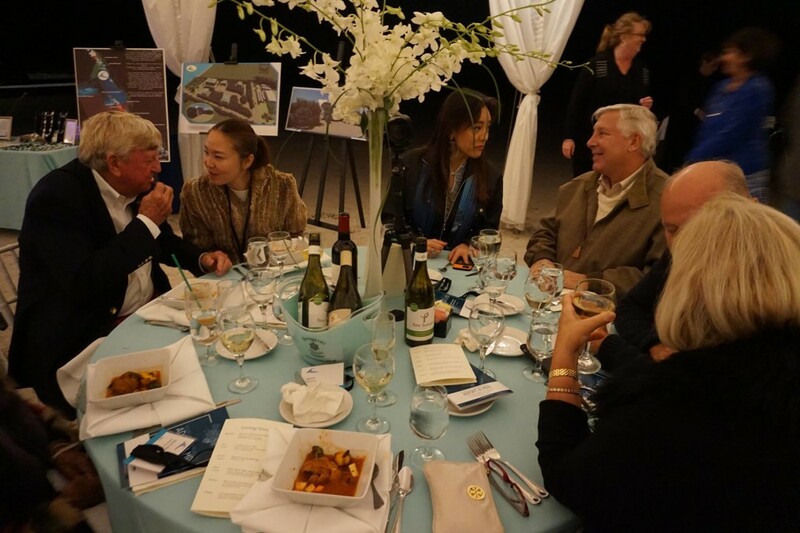 As usual we mingled with old friends and colleagues and made new friends and connections to our global oceans! 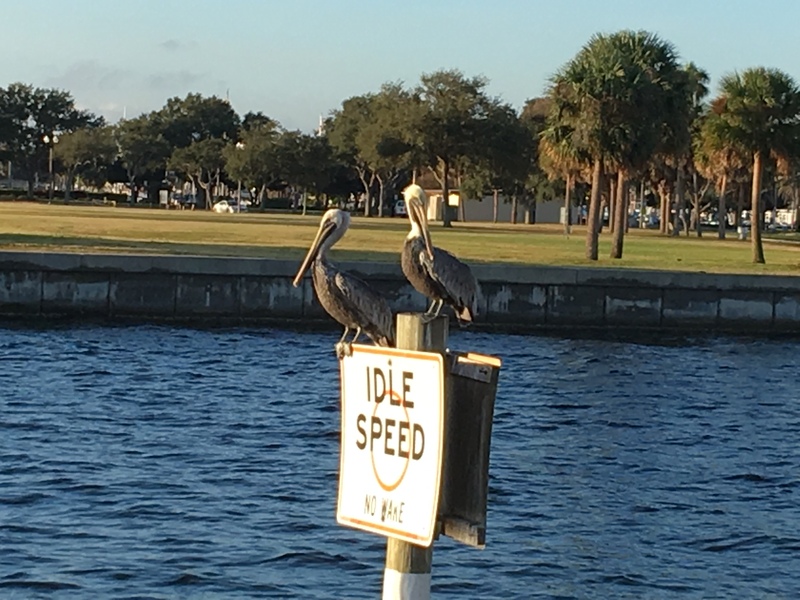 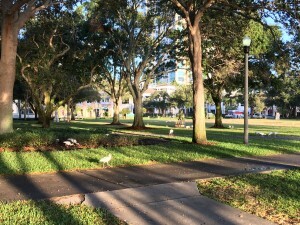 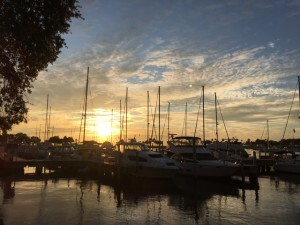 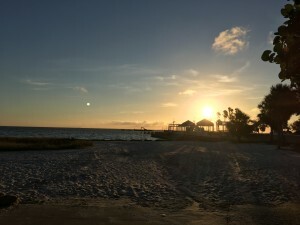 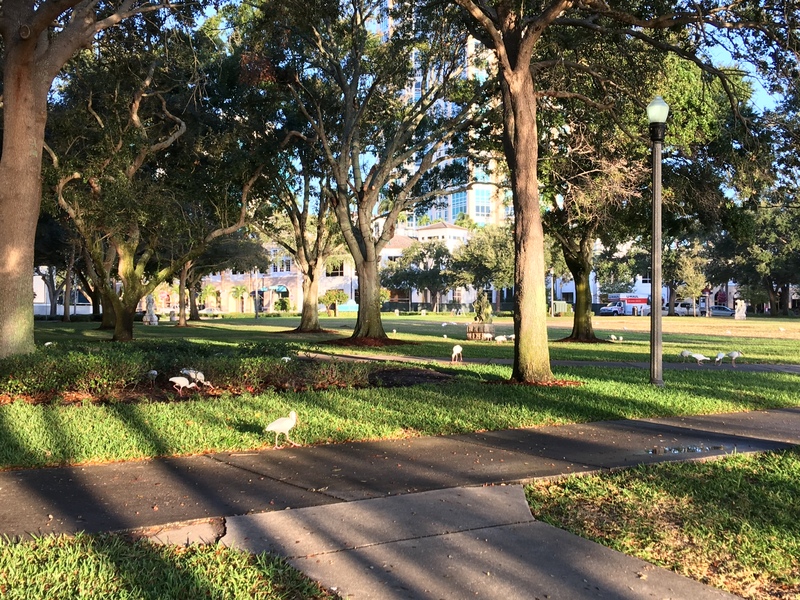 Downtown St. Pete and our gulf beaches were spectacular! 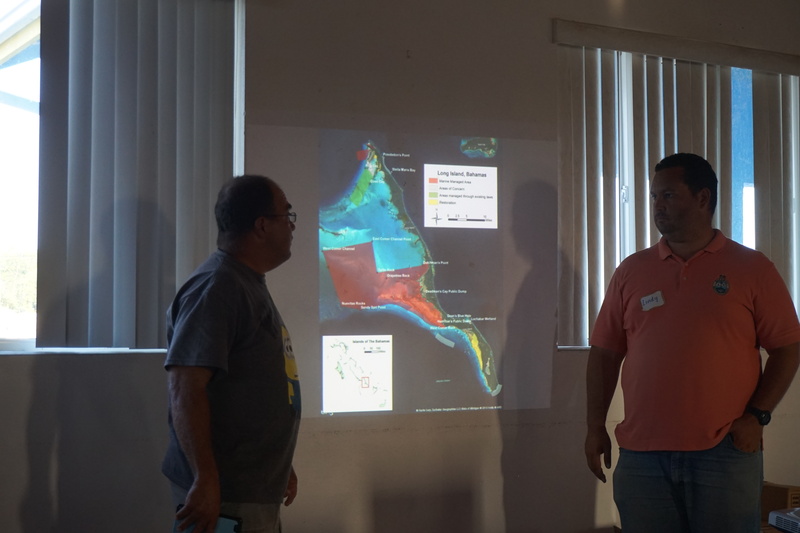 Ocean Crest Alliance Director Joseph Ierna Jr, was part of a two day workshop on 13th & 14th September, 2016 to gather stakeholder input as we seek to update the Ecological Gap Analysis. 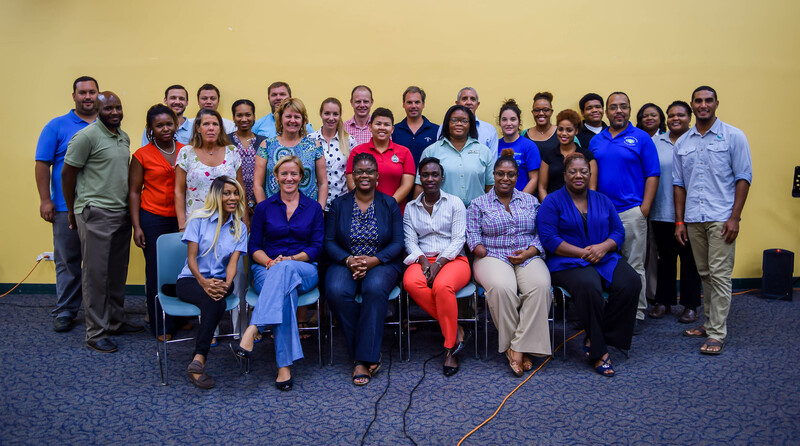 This exercise is part of the 3-year project Realizing The 2020 Goal to Effectively Manage & Expand Bahamian MPAs. 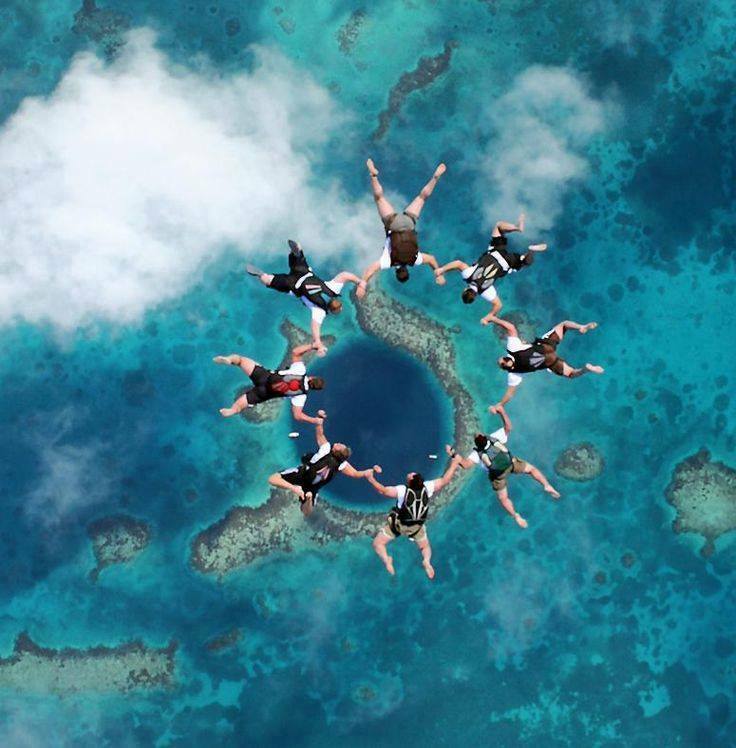 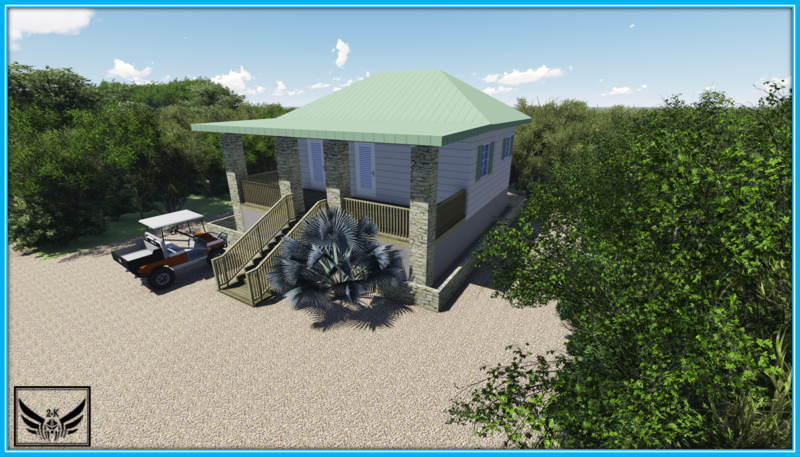 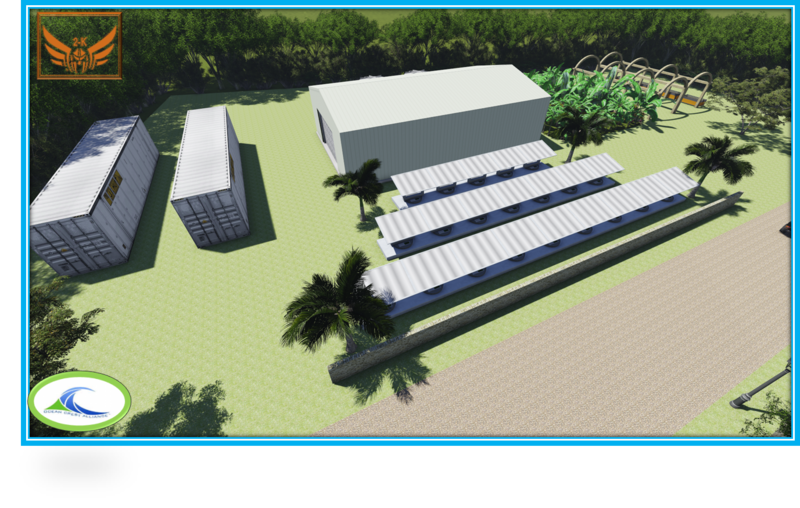 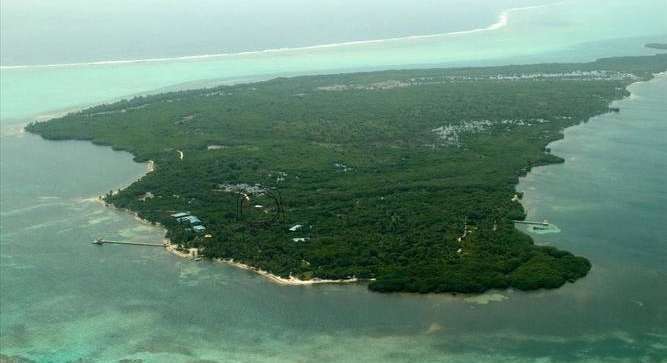 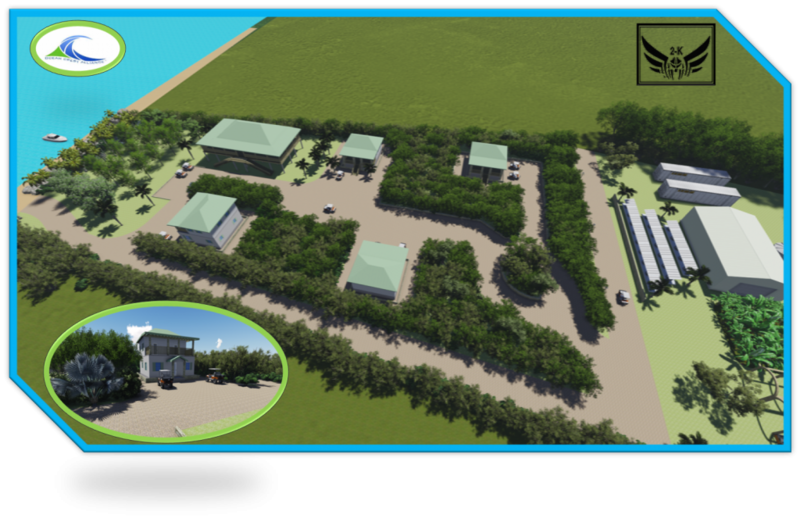 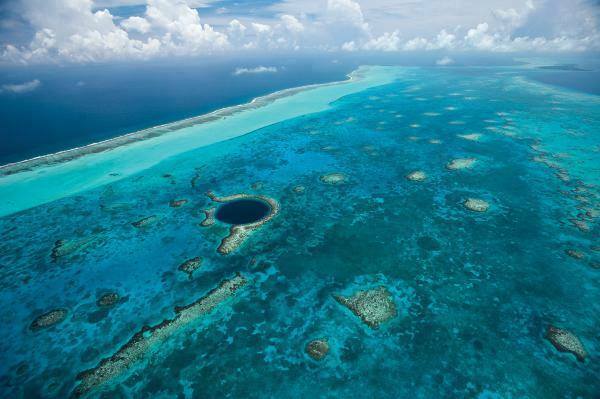 Oceam Crest Alliance enters into a “commercial lease” agreement with Itza Lodge, Pleasure Island Limited, Light House Reef Conservation Institute of a 3500 sq ft building and out buildings on property located on Long Caye Belize. 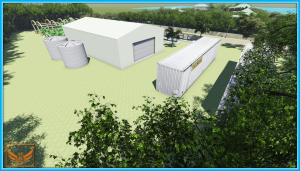 This lease is the start of a long-term operations with LRCI to design and operate a 210 acre preserve on the island through the OCA Eshare® program base. 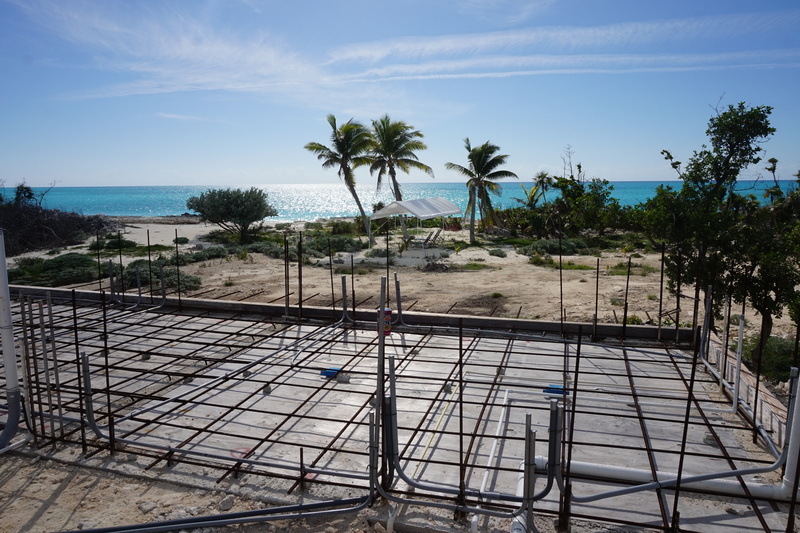 WE LOOK FORWARD TO THE JOURNEY AHEAD! 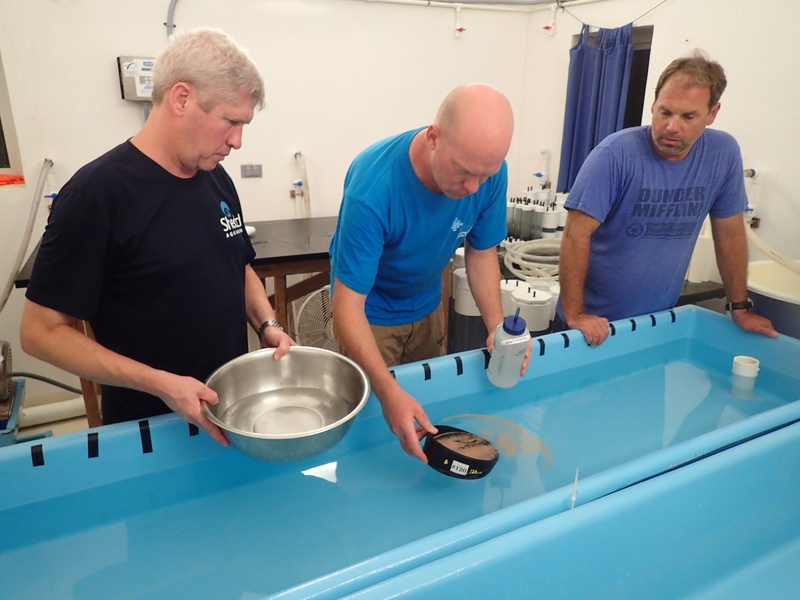 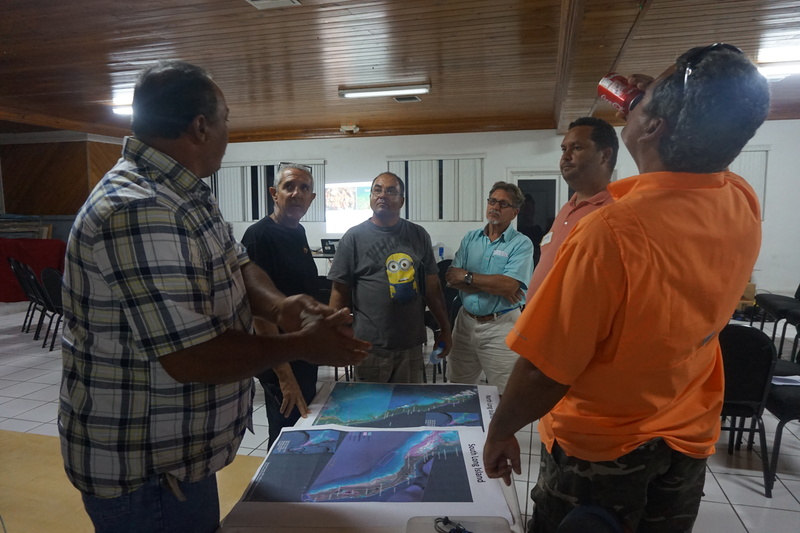 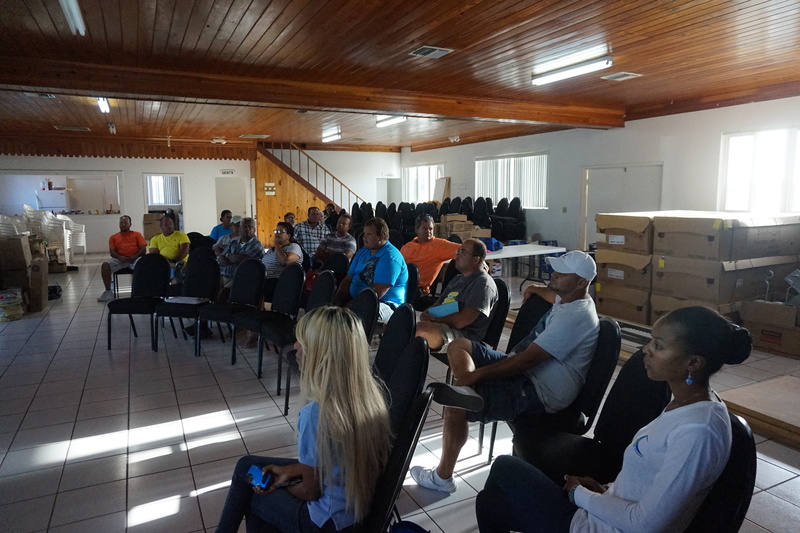 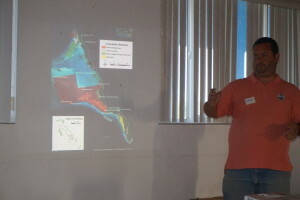 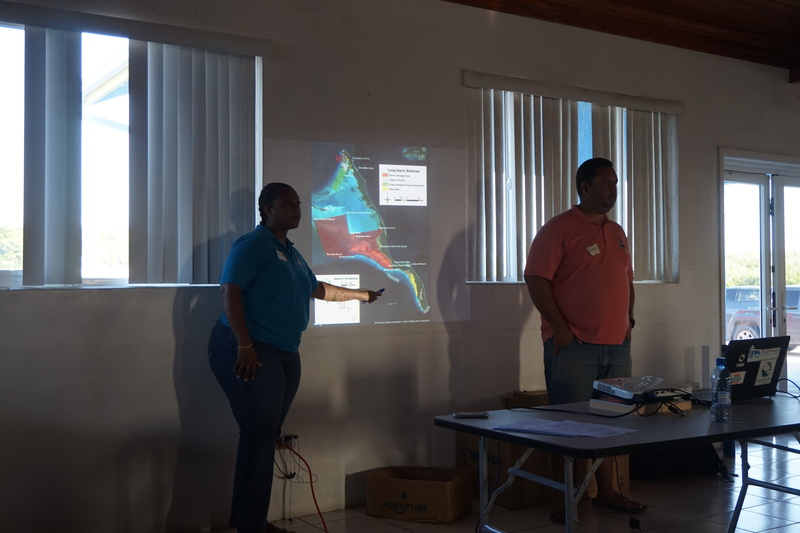 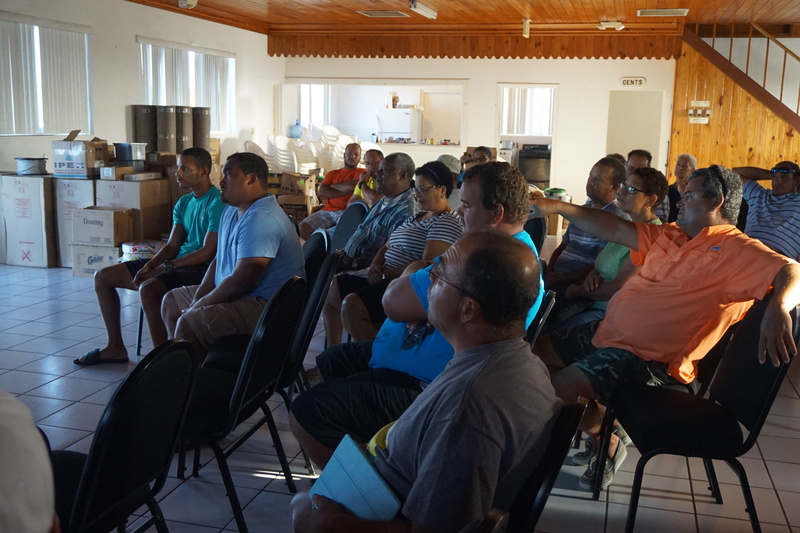 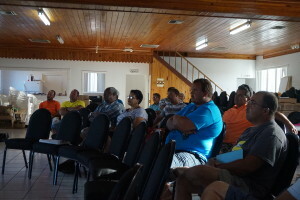 From August 19-31, OCA Director, Jospeh Ierna Jr. participated the “Reverse the Decline” Coral Restoration workshop, led by Dr. Craig Dahlgren of Perry Institute of Marine Science, the Bahamas National Trust and Dr. Dirk Petersen Founder and Director of Secore International. 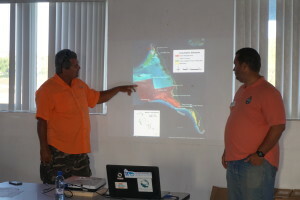 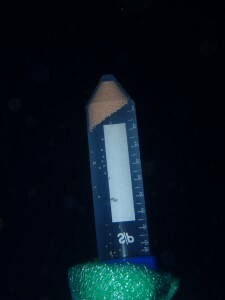 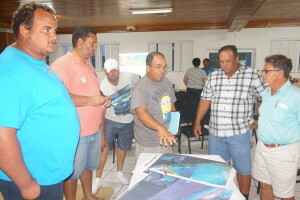 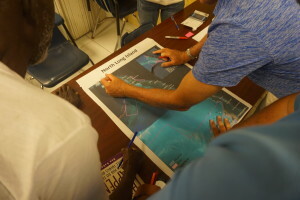 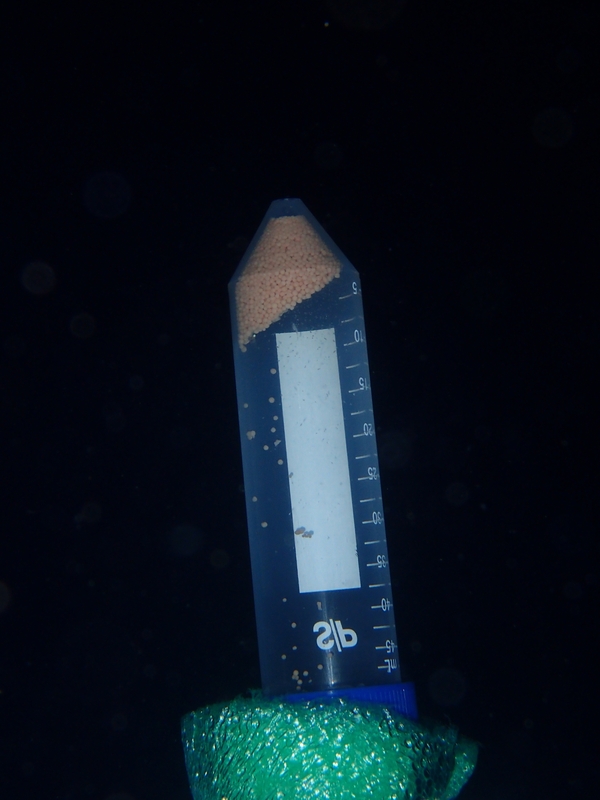 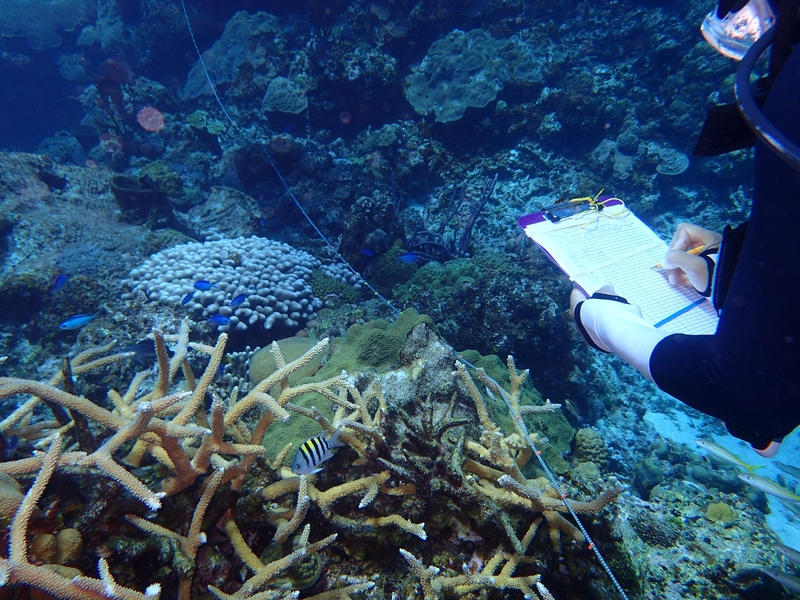 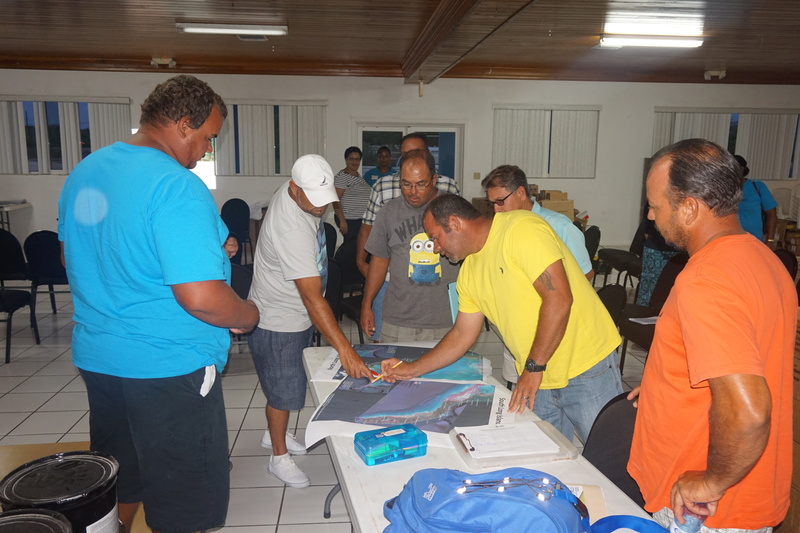 During the 10 days of diving, classroom and lab activities, the program utilized is the coral reef data collection and analysis tool known as AGRRA; the Atlantic and Gulf Rapid Reef Assessment program. 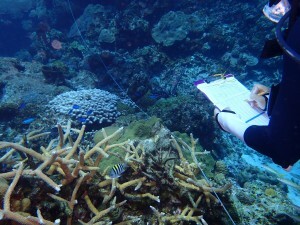 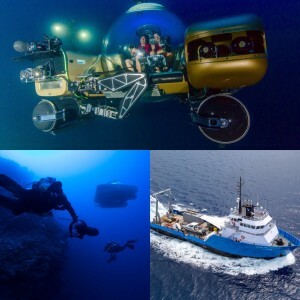 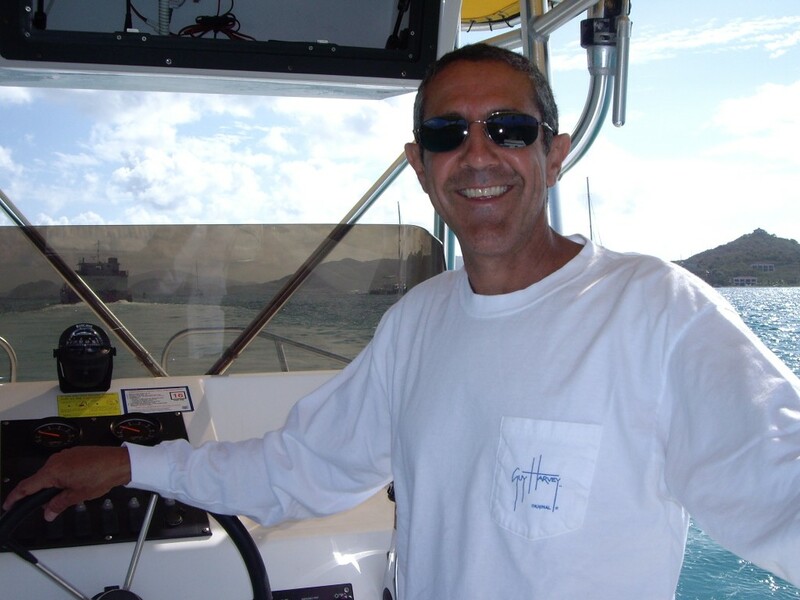 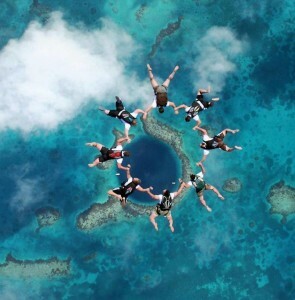 It was started by Robert Ginsberg in the mid- 1990s following a large gathering of coral reef scientists from all around the world. 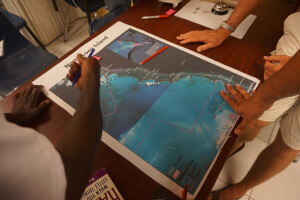 Ginsberg wanted to know what was the status of reefs across the tropical Western Atlantic, so the program was designed to try and answer that question. Out on the waters off Eleuthera, we assessed important structural and functional attributes of reefs using a standardized protocol so the data can be broadly comparable. 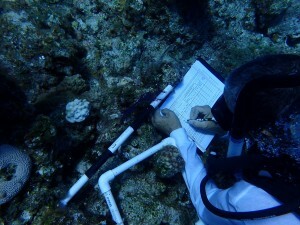 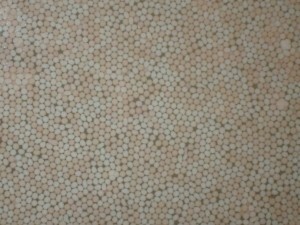 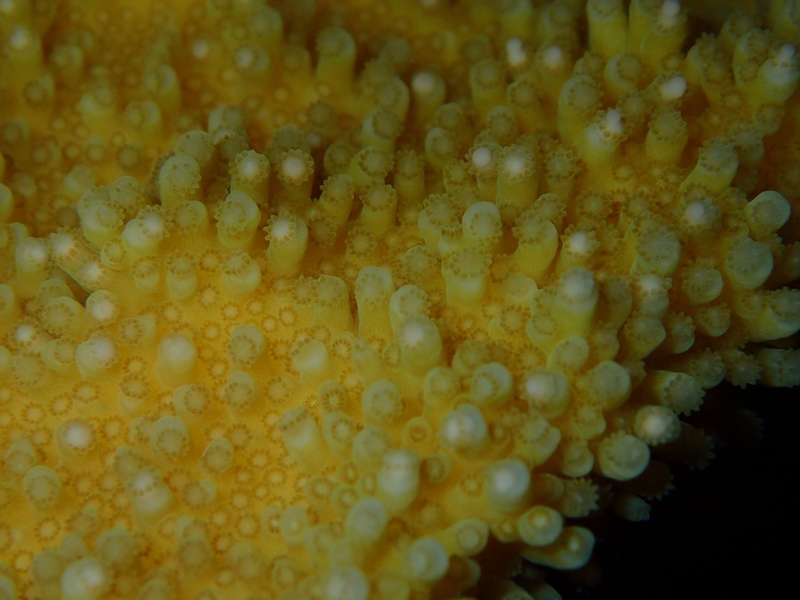 That means we’re mainly focused on the stony corals that are the primary constructors of the reef habitat, the herbivores that help to control the growth of the algae there, and the predators of both. 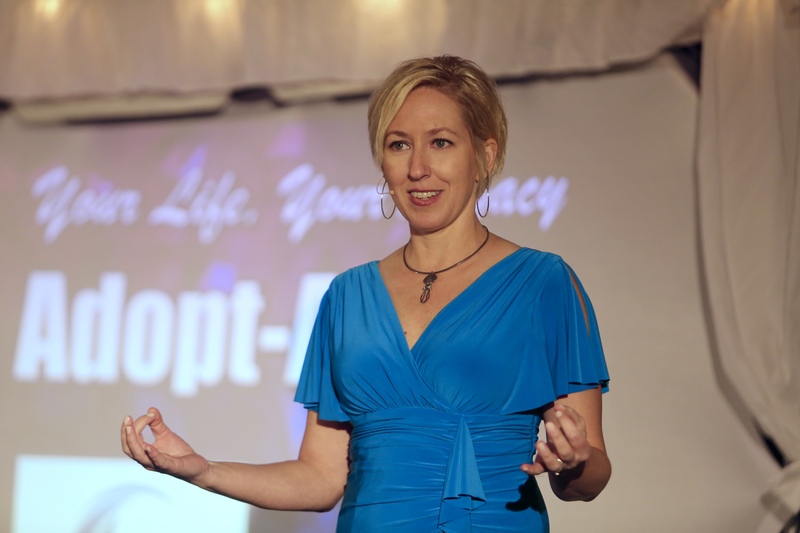 Data Density brings Credibility! 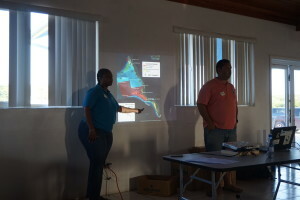 Photos by Dr. Craig Dahlgren and Joseph Ierna Jr.
Bahamas National Trust hosts 3rd Long Island Marine Protected Areas meetings in North Long Island and South Long Island to discuss next steps of the proposed 215,000-acre Long Island Marine Management Area (LIMMA). Outcome led to an expansion to the deep water areas of the LIMMA, with adjustments to the existing management of the area. 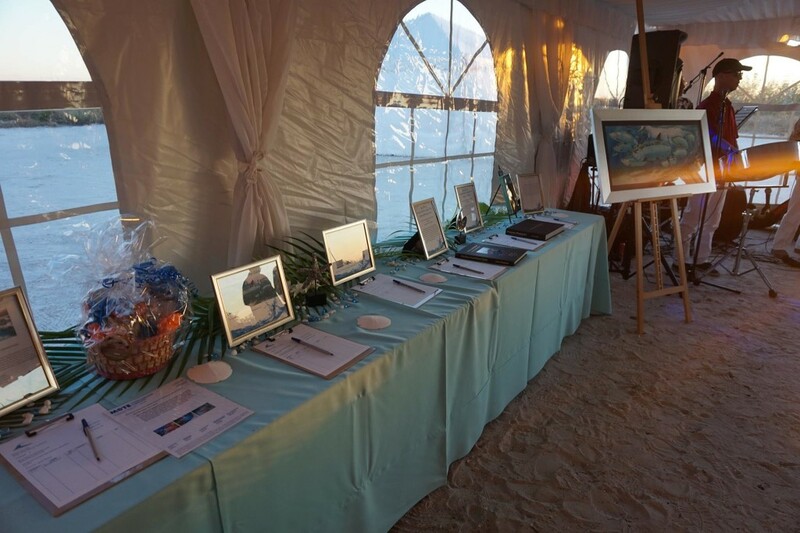 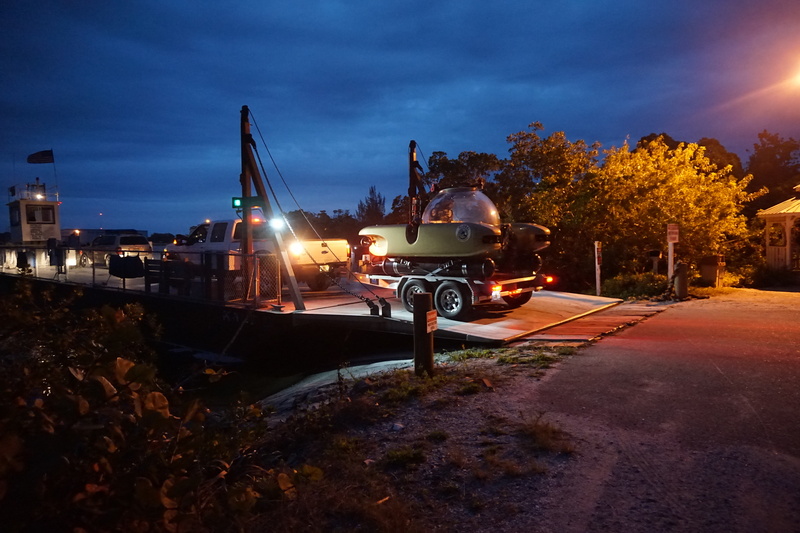 Having the community work to help design and develop the Long Island Marine Management Area is very rewarding making them stewards of the area! 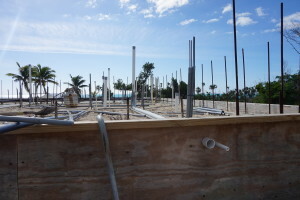 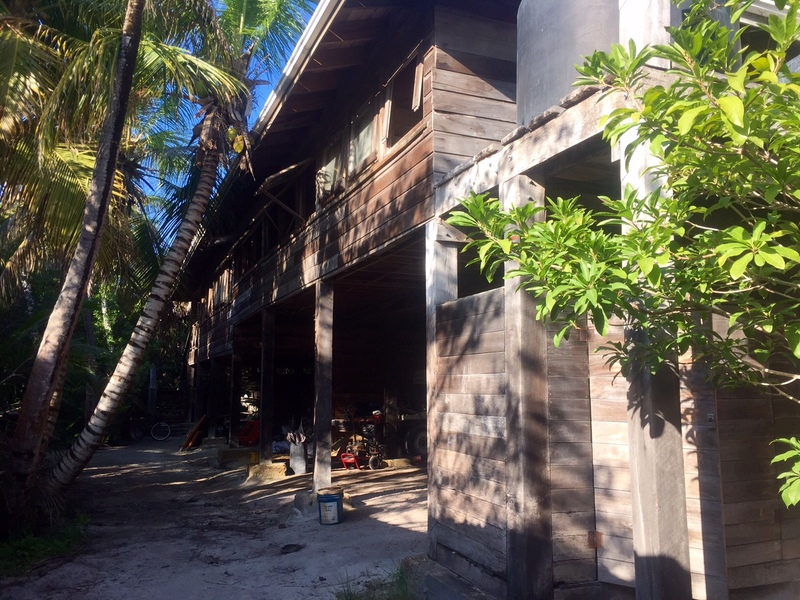 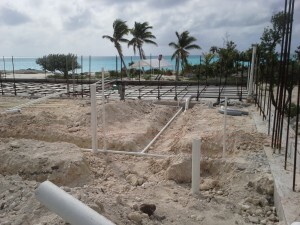 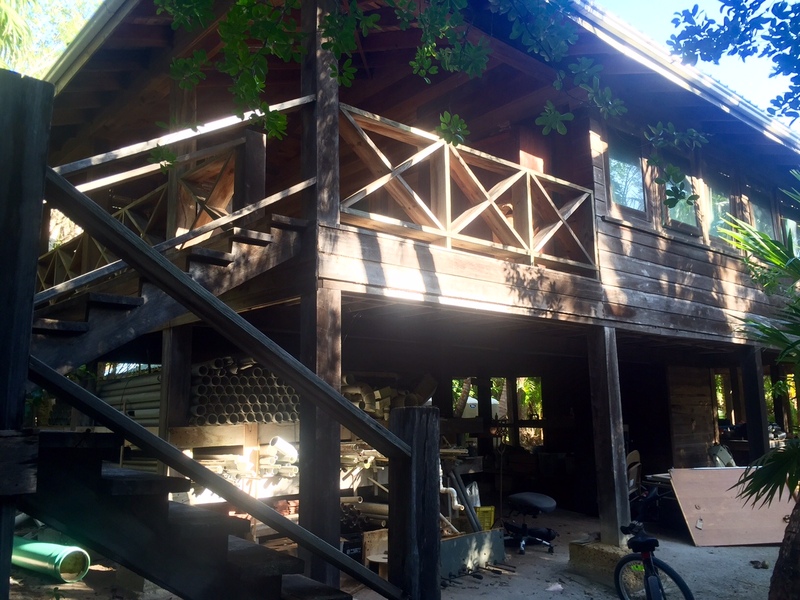 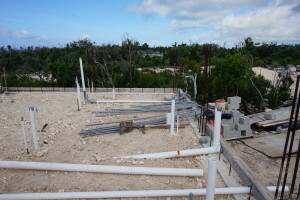 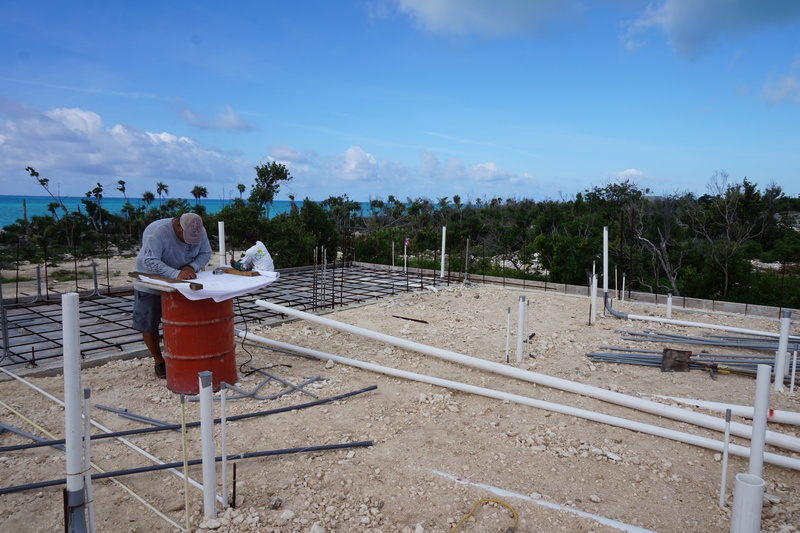 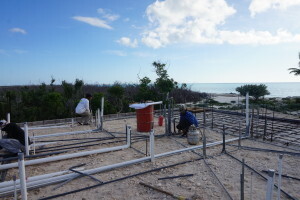 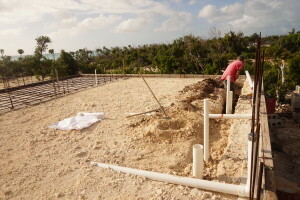 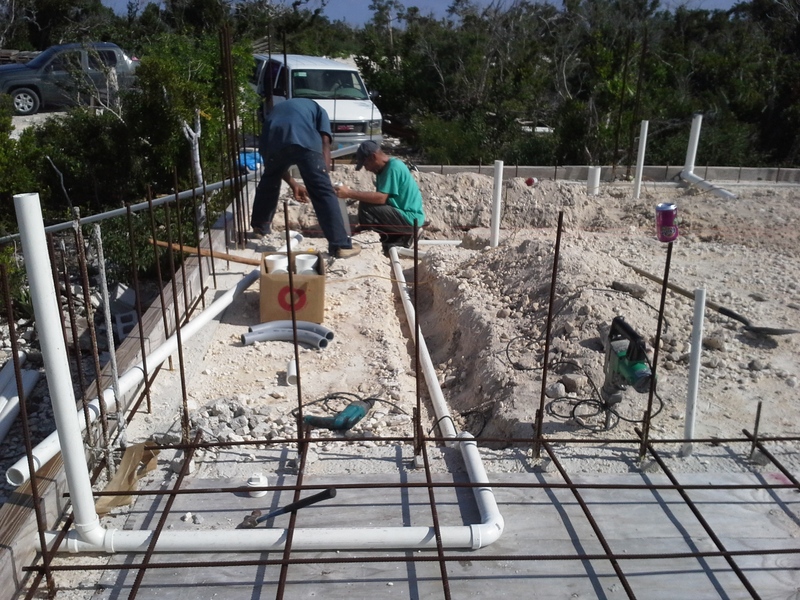 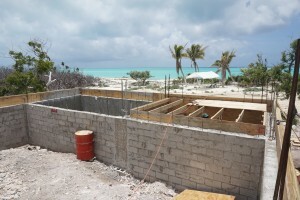 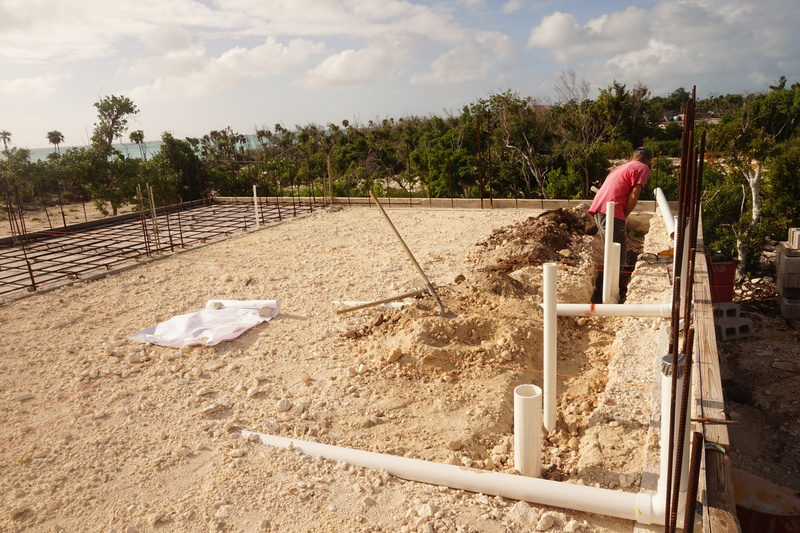 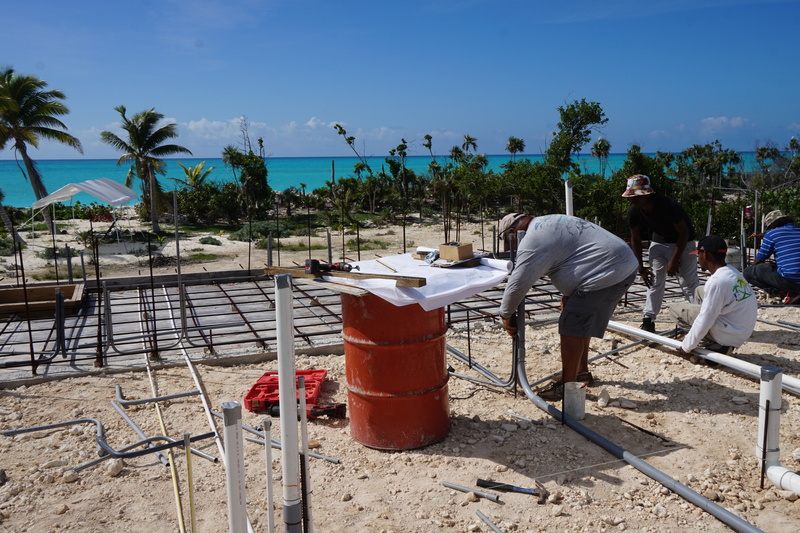 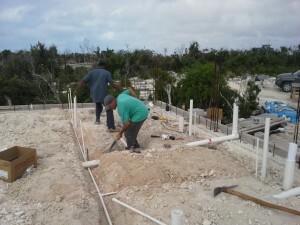 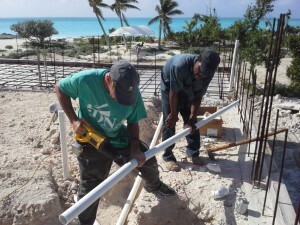 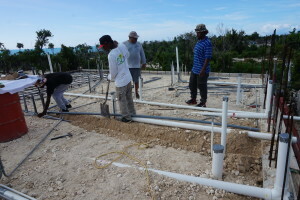 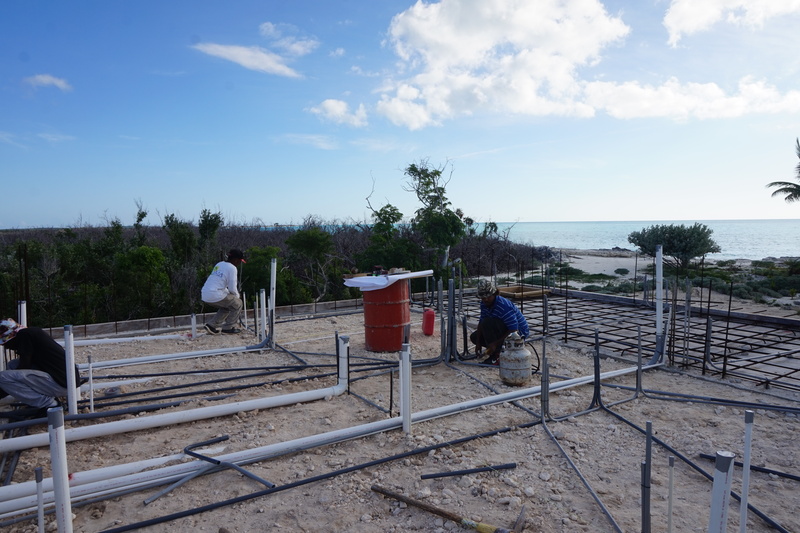 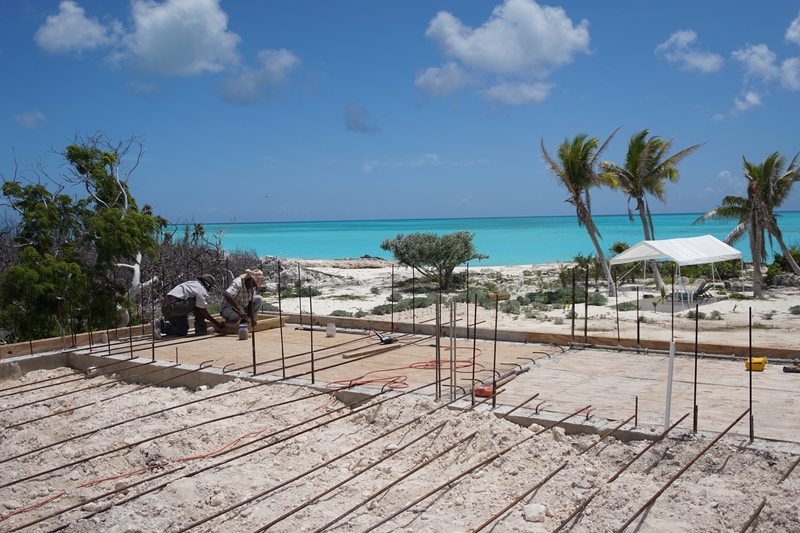 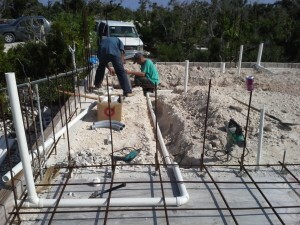 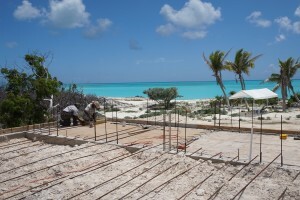 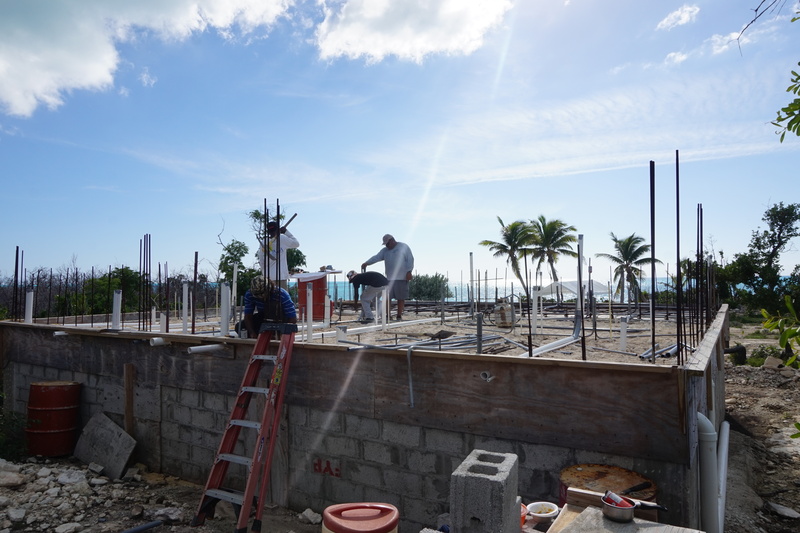 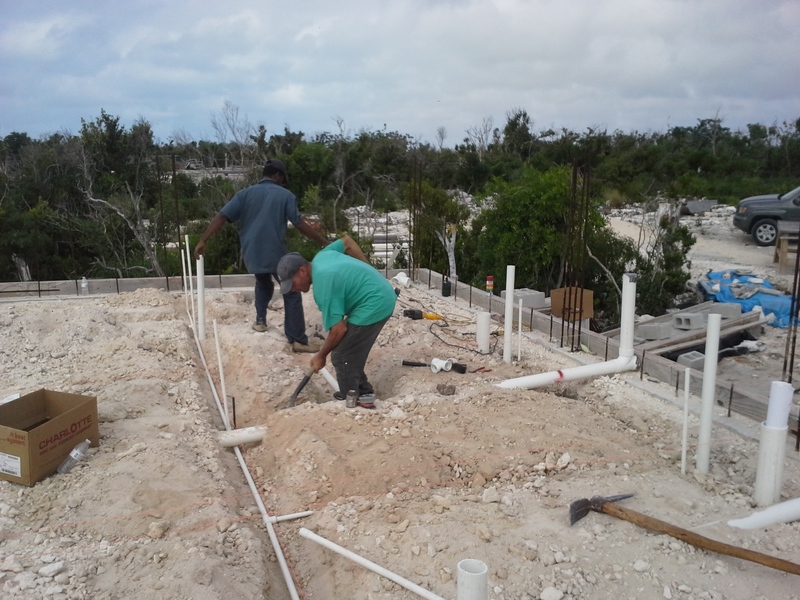 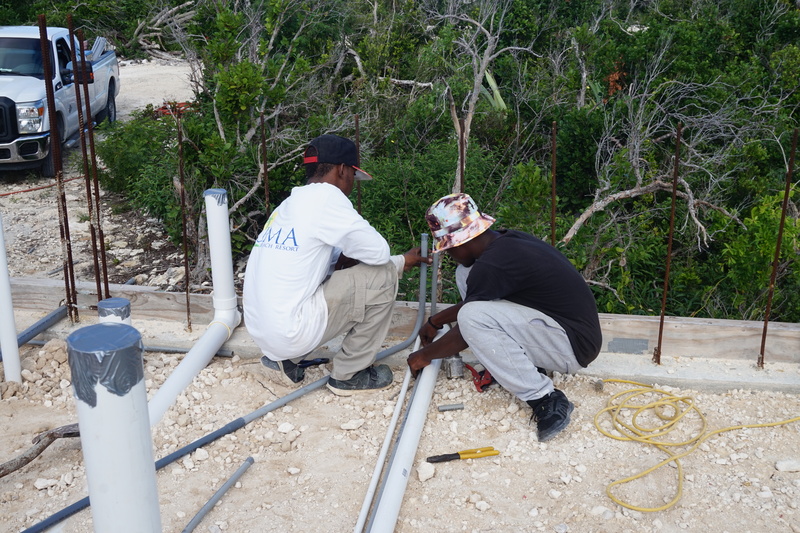 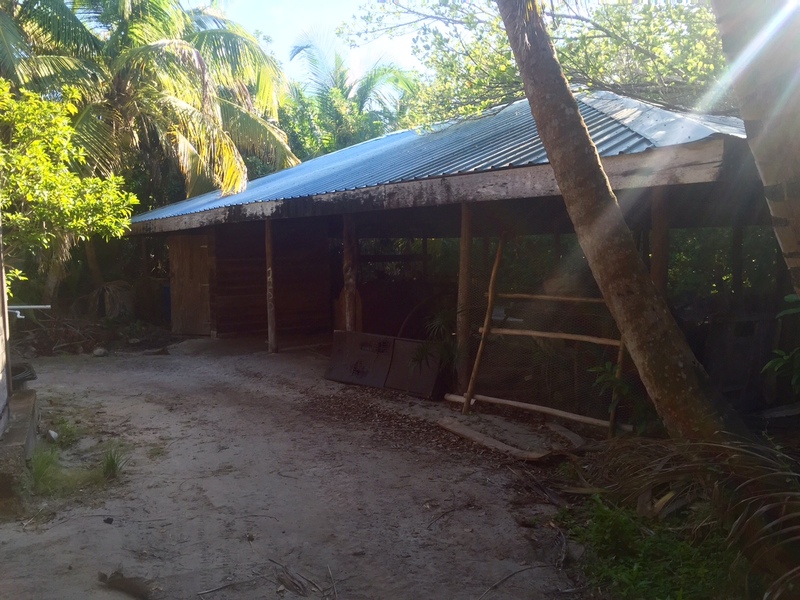 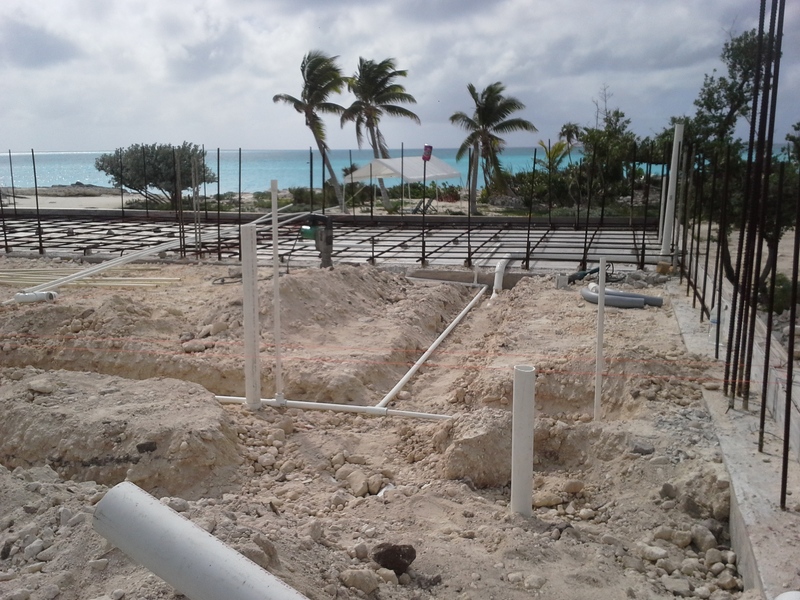 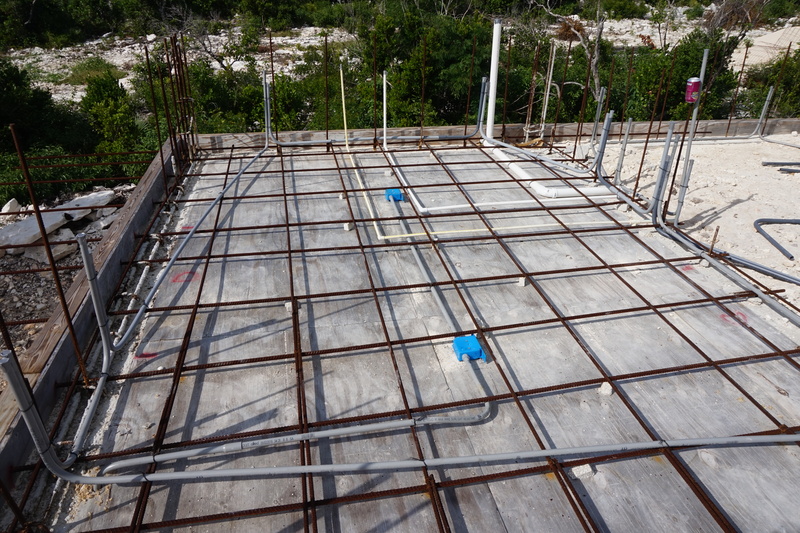 We have been very busy here in the Bahamas with the construction of the Kitchen Kottage on the Ocean CREST Alliance Research and Education Facility property, located at Cabbage Point, Long Island, Bahamas! 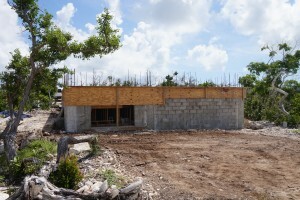 The building that is being built in Honor of our beloved Jay Kitchen! 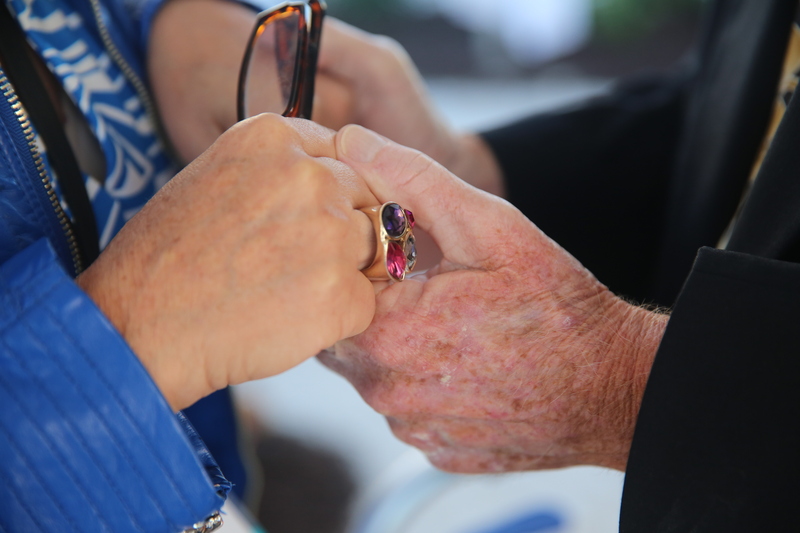 Many of you have been following and writing in to us on our progress and we thank you for this continued support. Due to the generosity of all the OCA supporters, friends and family, the “Kitchen Kottage” is starting to take shape nicely! 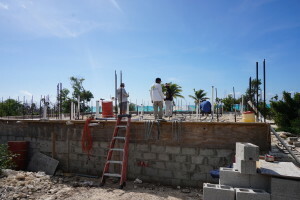 To give you a brief update on our progress; with a crew of 4 dedicated workers: Stephen Pratt (my father) and master builder of 45 years, Emond Smith, Dennis Watson and my husband OCA Director Joseph Ierna Jr, a couple of shipping companies, delivery truckers and machinery operators, during the months of July and August, our team has excavated the building site, drilled a fresh water well, installed fresh water throughout the OCA property, dug, tied steel and poured the concrete foundation, built an 8100 gallon cistern for catching rain water, designed and built a new pump/storage room, poured all the concrete columns, laid 975 block filling them all with steel and concrete — and all this preformed by the talented local Long Island craftsmen! On Long Island there is no cement truck services, so the work here is old time manual labor; very hard but rewarding!! 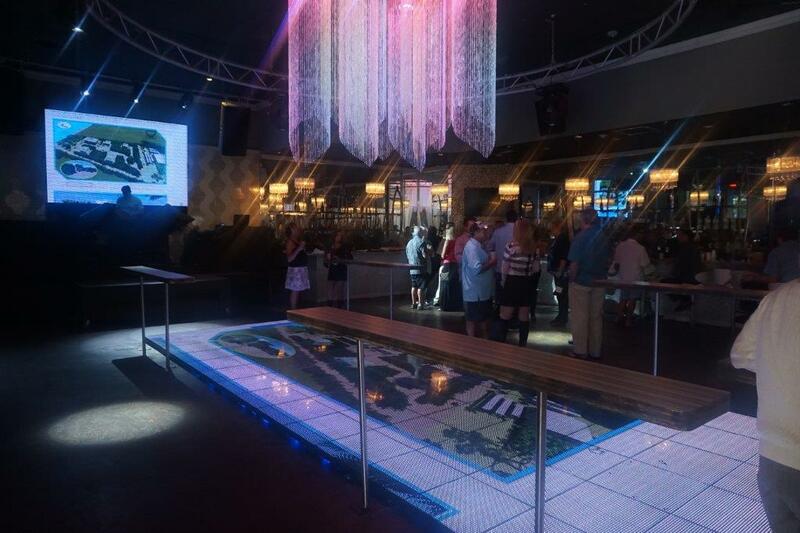 We are all loving every minute, seeing the design and the OCA Research and Education Facility come to life!! 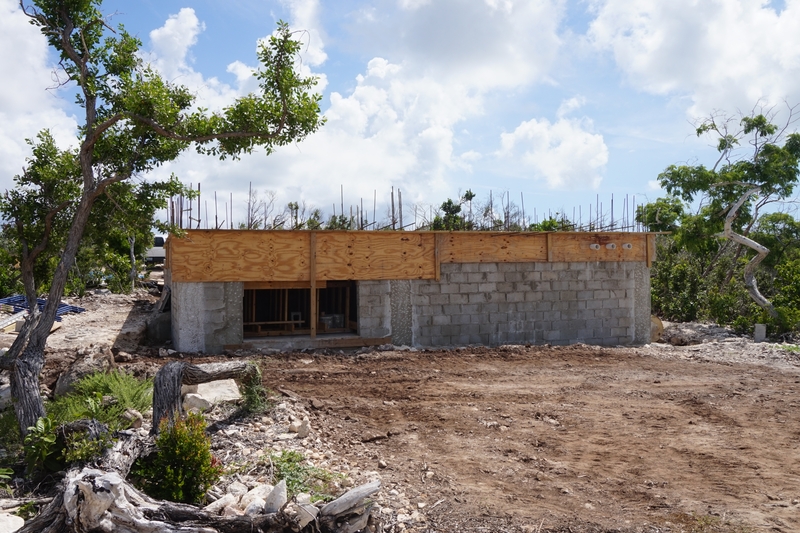 We wish to thank each and every person who has given generously to the construction of the “Kitchen Kottage” and we look forward to your continued enthusiasm and support of the OCA Research and Education Facility! 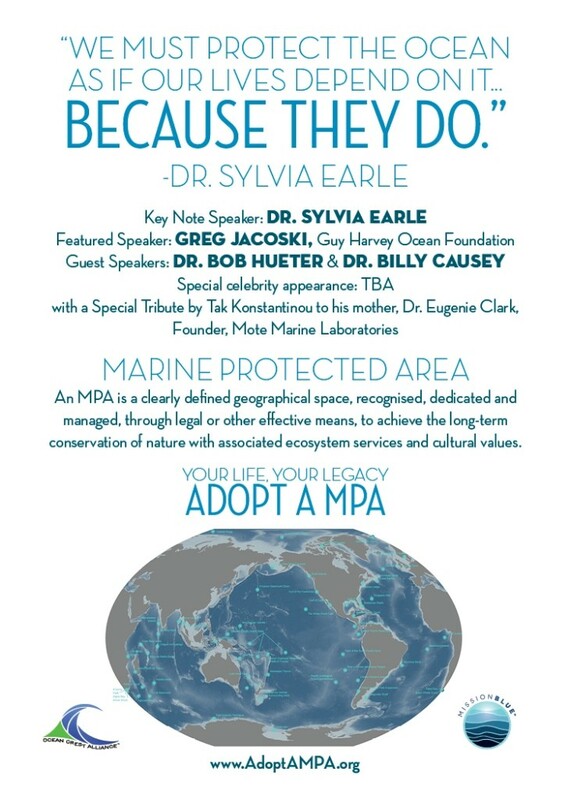 We are making BIG Waves locally, nationally and internationally in our efforts to build financially sustainable Marine Protected Areas (MPA’s), and without the generosity and support from you, this would not be possible. 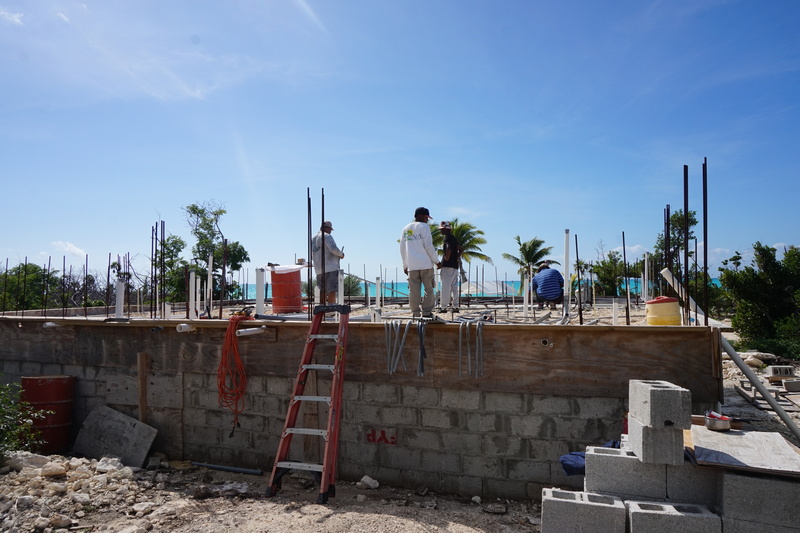 To date we have received $57,021.63 in donations towards the Kitchen Kottage and we require an additional $92,978.37 to complete this building. 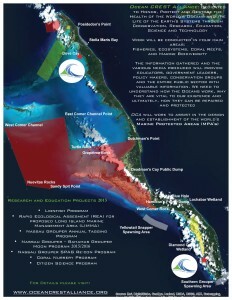 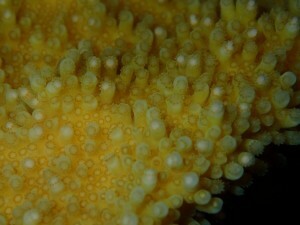 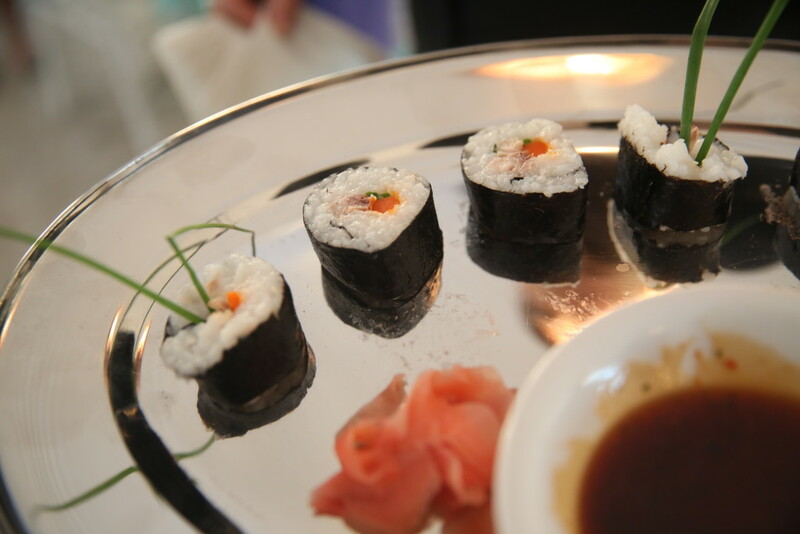 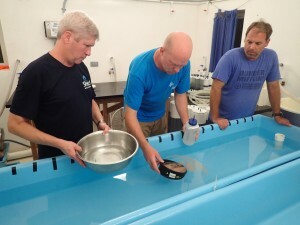 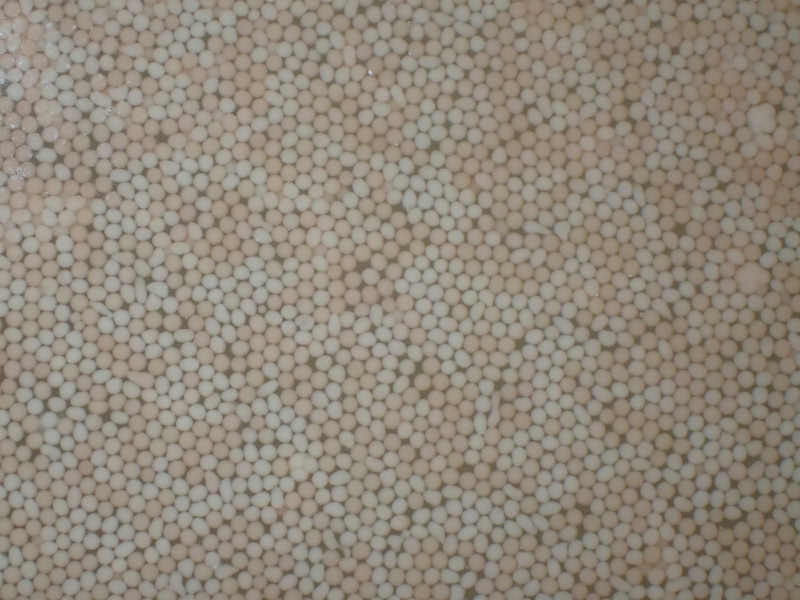 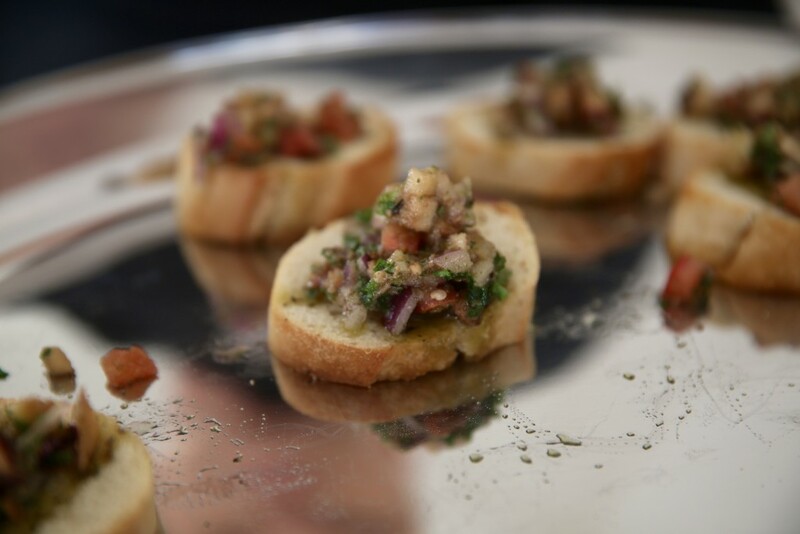 If you wish to make a donation you may visit http://www.oceancrestalliance.org/jaykitchen/ or contact us directly to speak on how you may give to the Kitchen Kottage, the OCA Research and Education Facility and the OCA E-share programs and projects. OCA secures a parntership agreement with Robert Carmichael and Todd Kincaid for the use of the Project Baseline 146′ vessel “Baseline Explorer” and assets for projects in the Bahamas, Belize and Cuba. 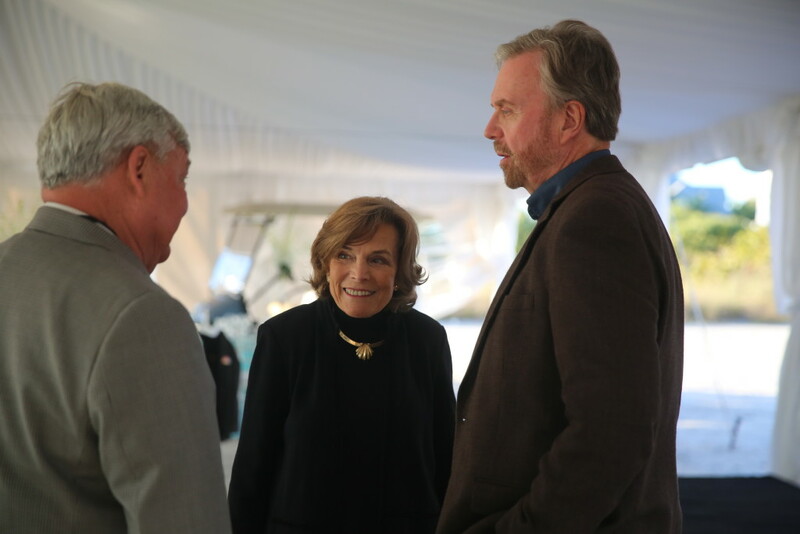 We look forward to this partnership, the exploration and the adventure! 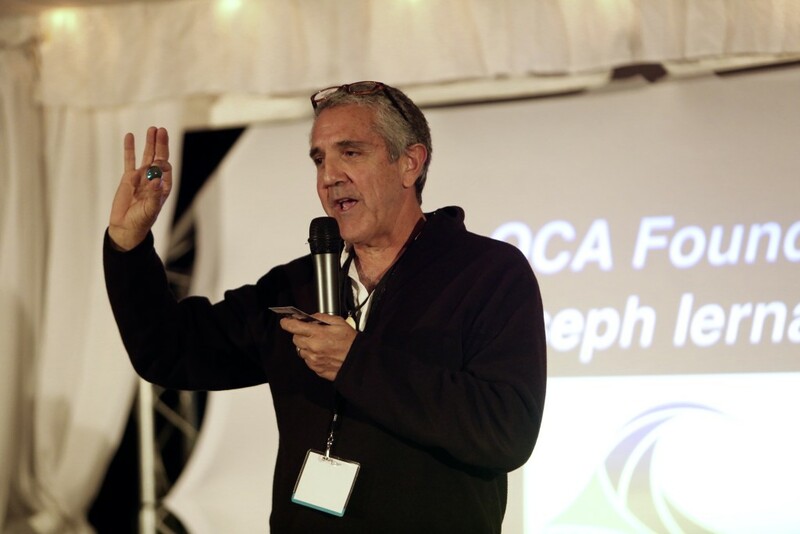 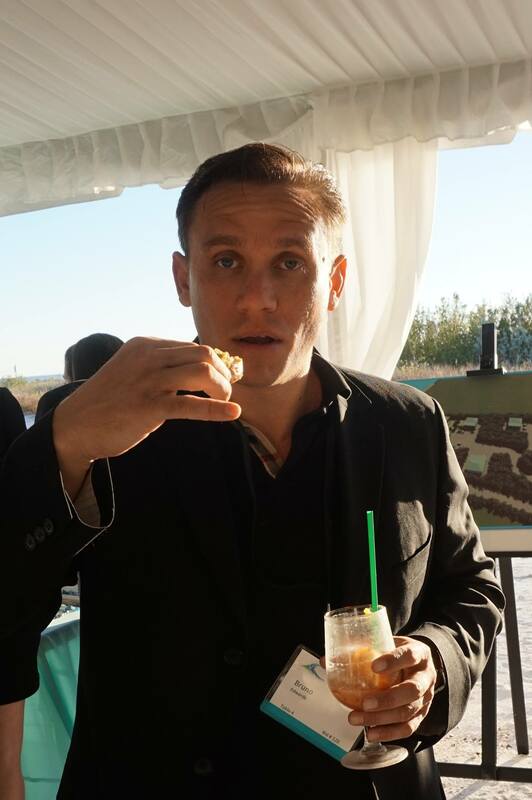 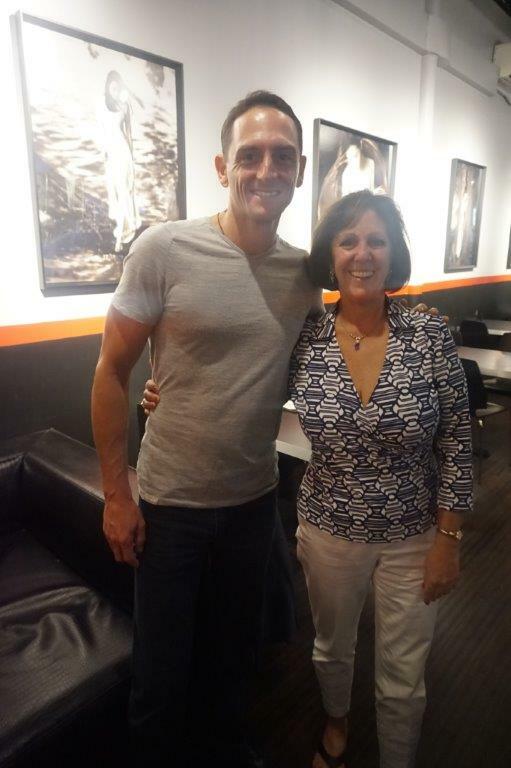 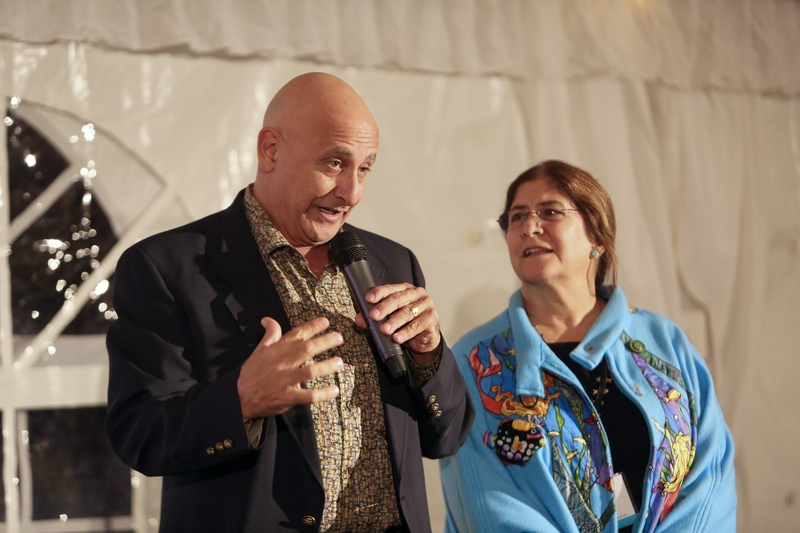 Captain Joseph Ierna Jr. Director Ocean CREST Alliance is the Member of the Week for the organization Too BIG To IGNORE.